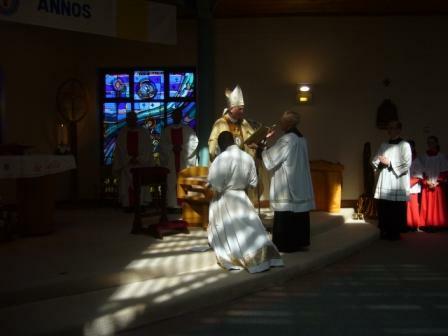 Welcome to the Order of St Camillus Website for the Anglo-Irish Province. During March 2017 we had two friends from Australia visit us. 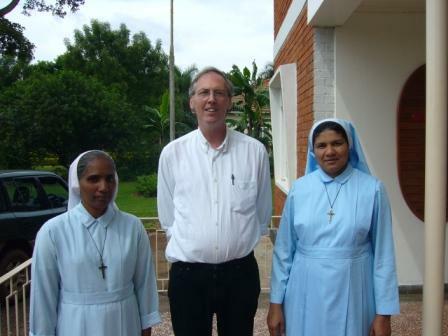 Mary Joyce & Mary Bairstow travelled all the way to Uganda to coincide with Fr Stephen's March visit. They brought with them supplies for the Health Centre that were needed and helped us by auditing our Pharmacy medication outflow. We made them most welcome. The two ladies met our Staff to instruct them on the use of the supplies they brought. They also travelled each day with our Staff on the Mobile Clinic to the various stations we regularly visit. Pictures to follow. 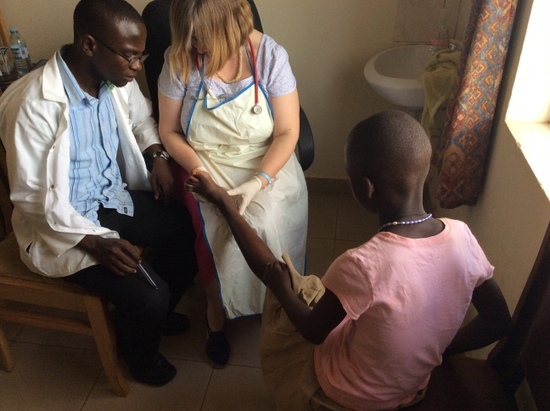 Dr Lilias Lamont volunteered her paediatric services to our St Camillus Health Centre in Kimaka, Jinja, Uganda during the month of February 2015. 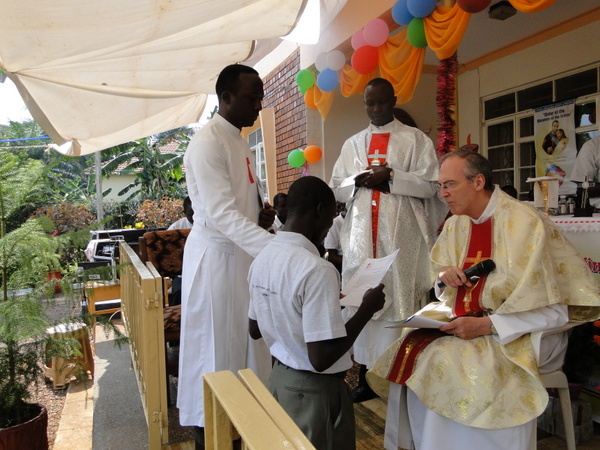 Fr Richard Lubaale wrote,'Dear Fr. Provincial greeting from Uganda. Thank you very much for the gift of Dr. Lilias. The work is going on fine and she is really overwhelmed with the number of patients that she has to see in a day. As I have already told you in my sms texts, once we knew that she was to come, we decided to offer free treatment to the poor children below twelve years, so that they could fully benefit from her presence with us. We also decided to mobilize the community to turn up for this chance of having an expert in children diseases with us. The turn-up has been over whelming as you can see from the pictures attached, to the point that she even has to refer some of the patients to the following day. We too did not know that we could receive over 60 patients a day. (photos above of Dr Lilias Lamont with a patient in the Health Centre and Martin, the clinical officer. The waiting room is full.) Therefore apart from knowing who the Camillians are in terms of health care, indeed many patients have found healing in the work of Dr. Lilias and the team. And my request is that every now and then we should have a medical personal offering similar services and help coming in. family and all Camillian confreres. 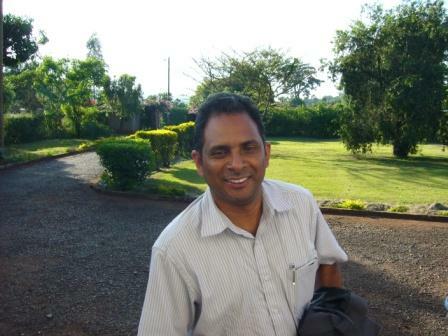 Fr Russel Jacob. God bless you Fr Russel. Let us remember him and all our men in Uganda. 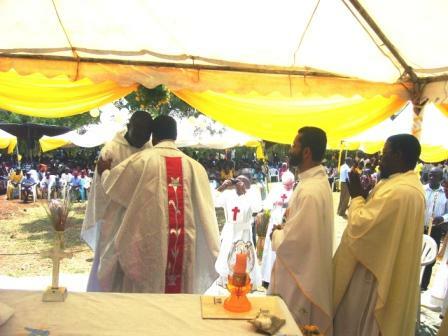 The first Ugandan has been ordained a priest in the 400 year history of the Camillian Order - known as the Order of St Camillus - . Rev. 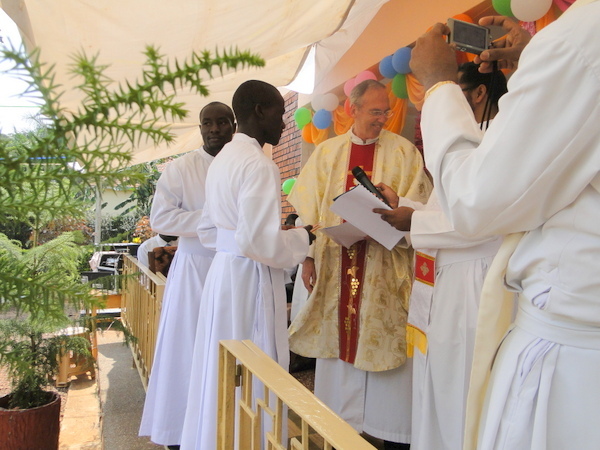 Richard Lubaale was ordained on 14th July last, the Feast of the Order’s Founder, St Camillus de Lellis, in his home parish of Kakira near the town of Jinja in Uganda. Three Camillians travelled from Ireland for this historic occasion. 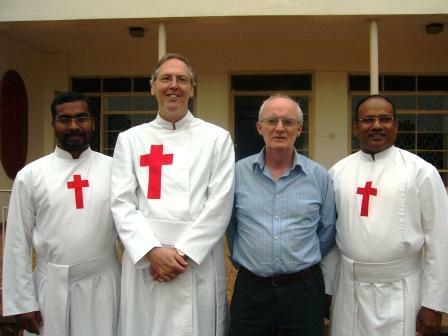 They were the Provincial of the Anglo-Irish Province, Fr Stephen Foster, together with Bro. Camillus McHugh and Bro. John O’Brien. 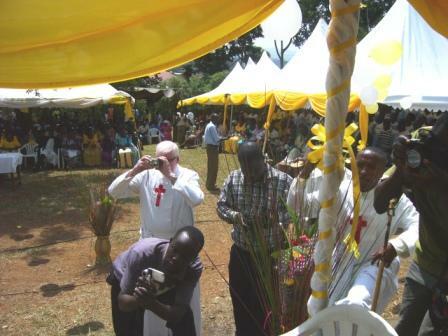 The ceremony was a prayerful festival of dance and hymns in true African style and brought great joy to all present. 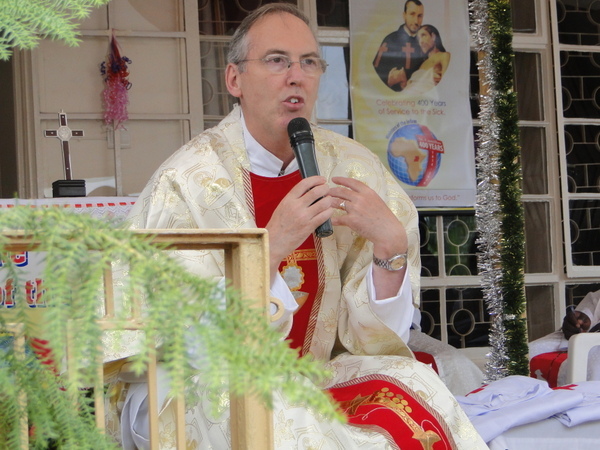 The ordaining prelate was Bishop Joseph Willegers, the now retired Bishop of Jinja. 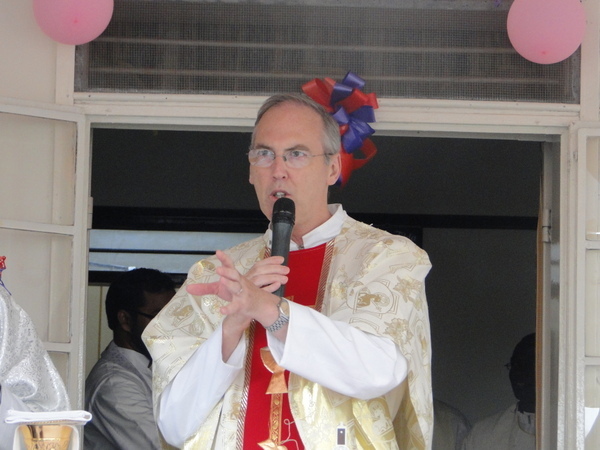 Bishop Willegers is a Mill Hill Father from Holland who went to East Africa 55 years ago after his ordination. 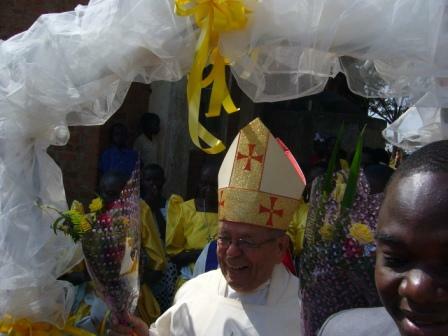 He was Bishop of Jinja for 42 years. 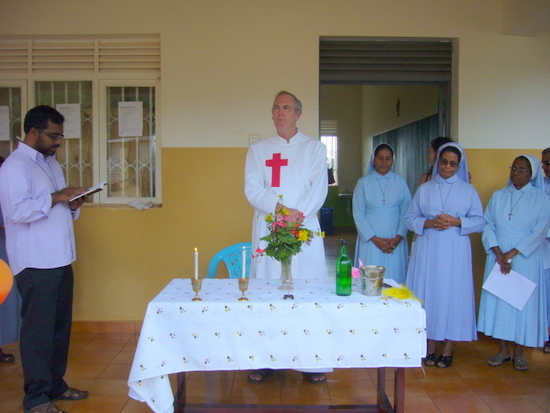 The Camillians began their Mission to Uganda over 10 years ago in 2000. Despite a shortage of manpower in Ireland the Camillians believed they were answering an urgent call to care for those many people who at that time were dying from HIV/AIDS. Many of them were very young and some of them parents with young children. The two priests who volunteered for this Mission were Frs Tom O’Connor (a native of Co. Kerry and Fr Tom Smith (who hails from Co. Cavan). 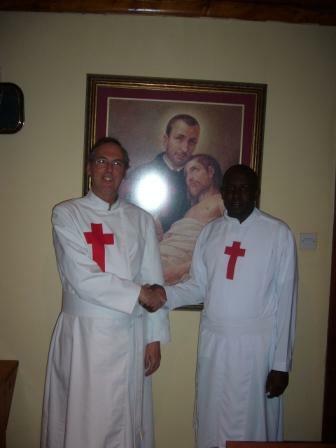 Both men established a base in the Lugazi Diocese and set about operating a mobile clinic to go out into the Bush to visit and care for the Sick who were too sick or too poor to attend a hospital. Many of the patients were simply hydrated with a drip (sometimes using the car lights at night-time for visibility in order to insert the drip) in order to make their last moments as comfortable as possible. 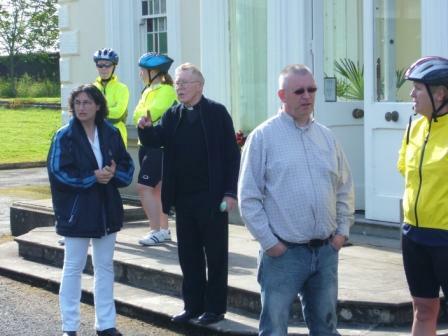 Thanks to the work of these two Camillian priests, many people are now alive who would otherwise be dead. The introduction of anti-retroviral drugs and counselling has enormously helped so many sick people who now have a better quality of life. 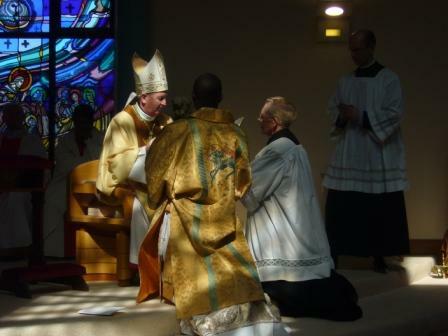 The two priests also set about - after a period of 5 years acclimatisation to invite vocations to the Camillian way of life which has now culminated in the first ordination. And we believe the first of many. 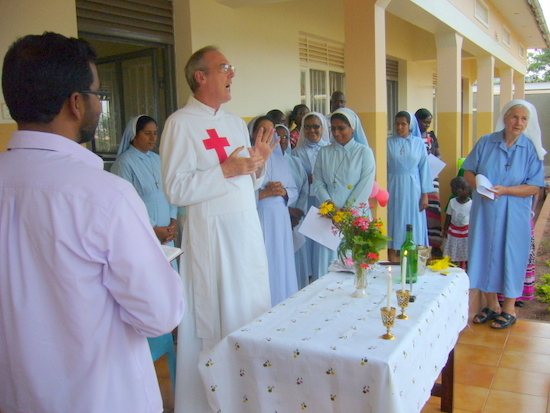 They also introduced a number of diocesan priests to health care by facilitating with the consent of the local bishops an opportunity to study health care courses at Master’s level at the Order’s University in Rome. 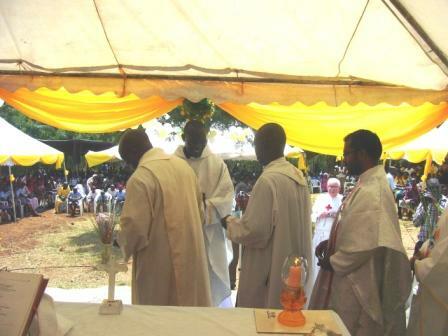 These priests then returned to Uganda where they lived for the next two years with our priests in order to implement what they had learned in Rome and then subsequently for them to return to their native diocese where they now can animate their fellow clergy. 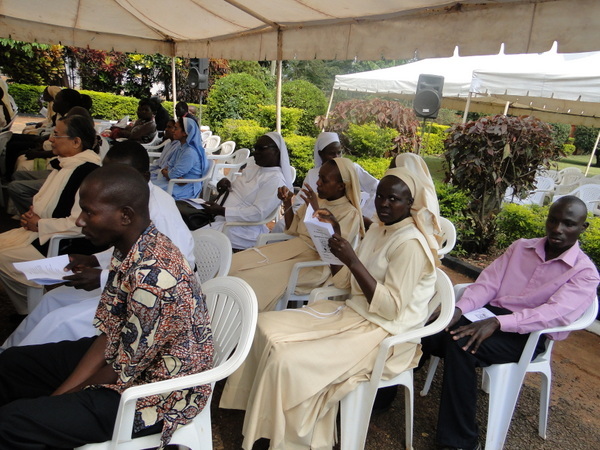 This is an important service as many people in Uganda had – and still have - a fear of being in contact with sick people. Bro. Camillus, Bro. John & Fr Tom line up to congratulate the newly-ordained. 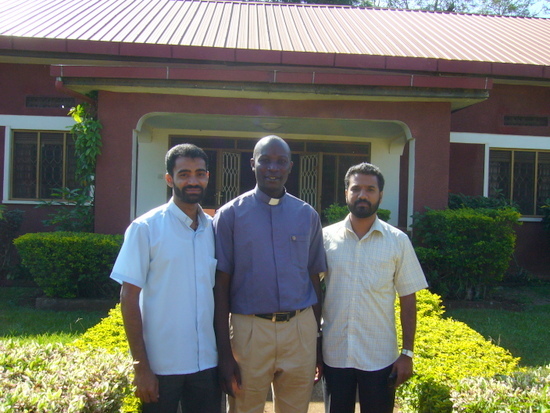 Last year 2010, saw the arrival of two Indian Camillians who have gone to Uganda in order to help in the work started by the Irish missionaries. 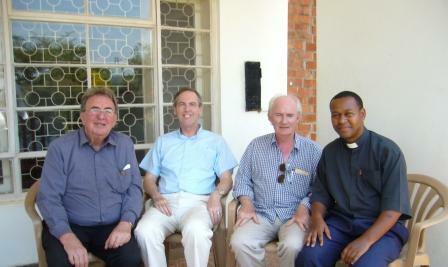 Fr Richard Lubaale will now work with these men as they take forward to the next level the work begun just over 10 years ago by the Anglo-Irish Camillians. Bro. 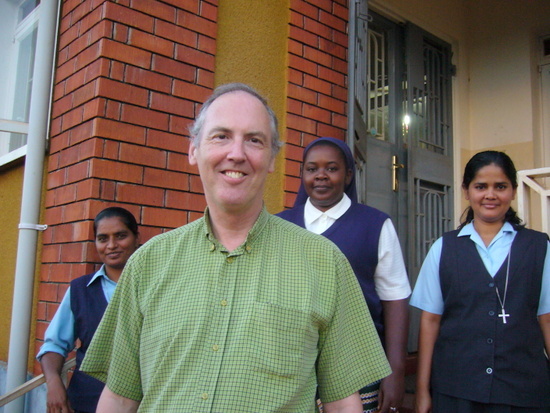 John O'Brien at the Community House, Jinja. Let us remember Richard in our prayers. If you missed the Ordination and would like to see it click here and then click again on click here and scroll down to bottom of page and click on ordination. Fr Stephen & Deacon Richard greet the worldwide congregation through the internet camera. 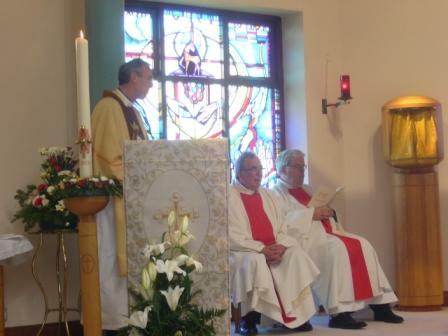 Fr Stephen, Richard & Bishop Michael Smith. 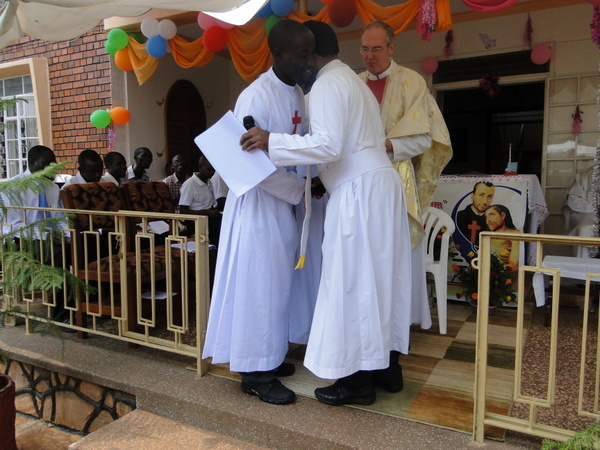 Our first Ugandan Camillian, Richard Lubaale, MI Ordained Deacon Sunday, 1st May. 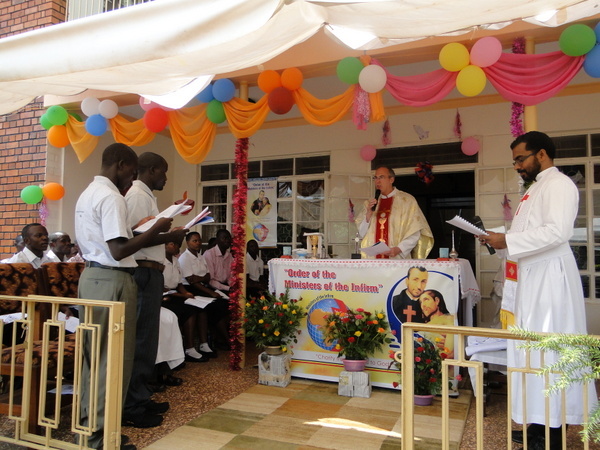 The morning of Wednesday 16 March sees Frs Johnson & Shibin leave early for Kampala in order to buy the items needed for the new students; the most important being the breviaries for their prayers and the crucifixes for their rooms. The building beside our house in Jinja is being renovated and will be ready to inhabit when the new aspirants arrive in the afternoon. 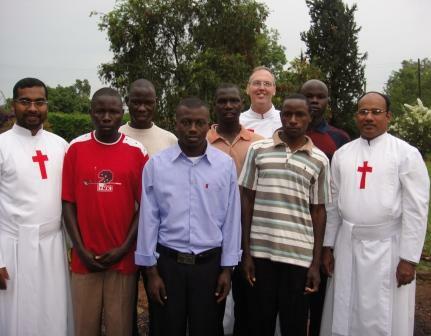 The Provincial, Fr Stephen welcomes new aspirants for the Order in Uganda. 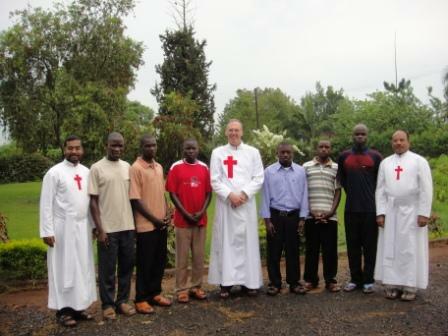 Wednesday 16th March saw him welcome 6(one has not yet turbed up) new aspirants to the Province who have been recruited by Fr O'Connor, Fr Johnson & Fr Shibin. The seven men were waiting for their exam results to see if they would achieve the marks necessary to obtain entrance into the Philosophicum. During March & April they will undergo the aspiration programme and then will be sent to various hospitals and health care facilities during May & June to care for the Sick. 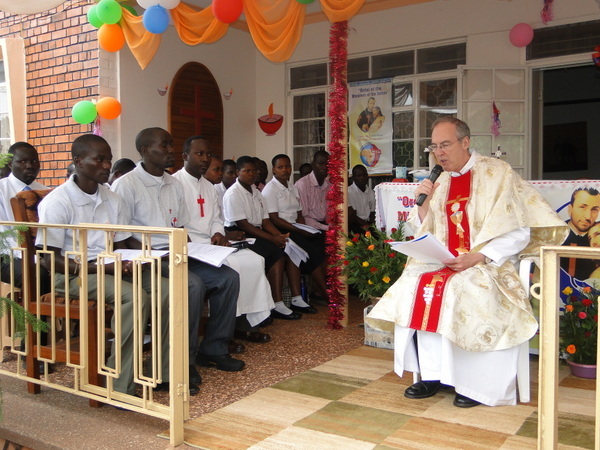 If they pass the programme of vocation discernment they will begin their philosophical studies in the Philosophicum in Jinja in August. Let us pray for them. There was an eighth candidate who unfortunately did not acquire the required mark in his exam and we pray for him as he is very disappointed. We will encourage him to persevere and not lose heart. 'Every day, as long as this today lasts, keep encouraging one another.' Their Formators will be Frs Johnson and Shibin. 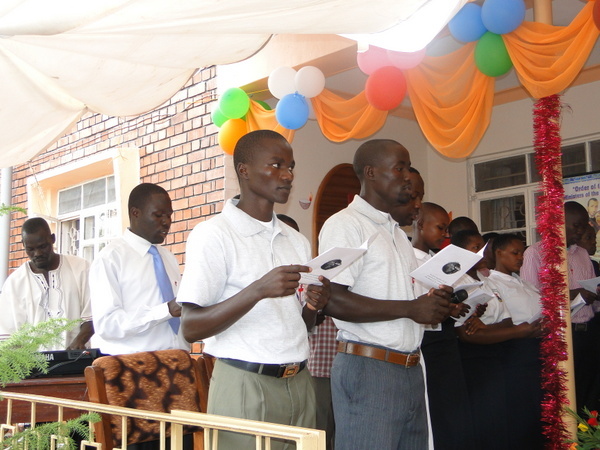 All the aspirants are from the Hoima Diocese. St Patrick's Day. It was actually drizzling while these photos were taken. St Patrick's Day 2011. A good day to join the Anglo-Irish Province. 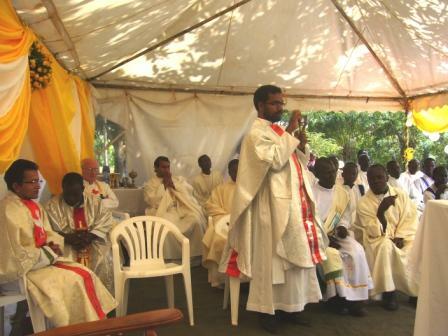 The week of January 15-22, 2011, sees Fr Stephen the Provincial first in Kenya and then in Uganda to be present during the Fr General's visitation. The General, Renato Salvatore accompanied by the Secretary General, Bro. 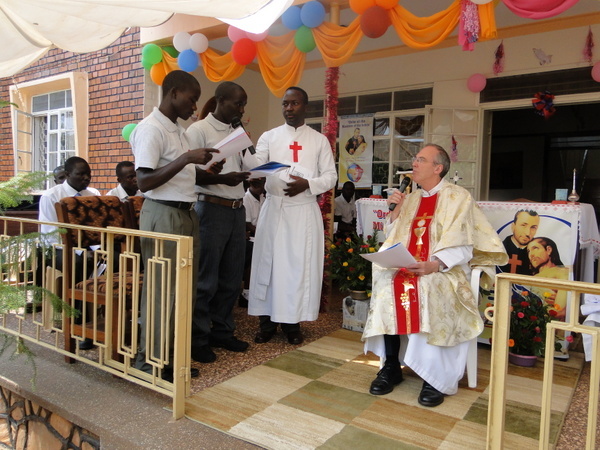 Luca Perletti is visiting Uganda from the 18-21 January. 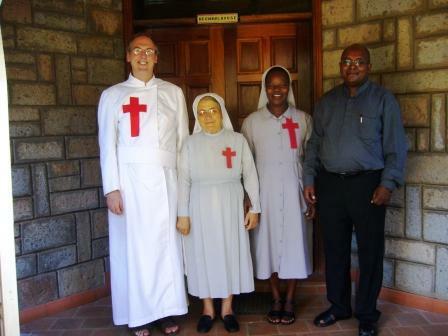 Srs Veronica & Catherine with Frs Stephen Foster & James Wanjau. Bro. 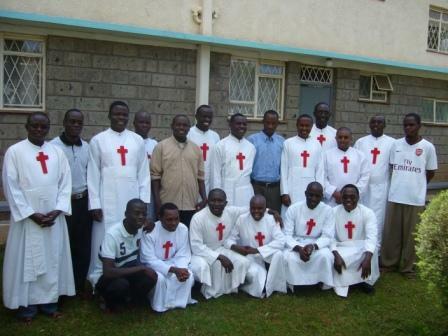 Elphas will be ordained a priest on February 26 by Bishop Philip Sulumeti of the Kakamega Diocese in Kenya. The Ugandan Philosophical students belonging to our Province. 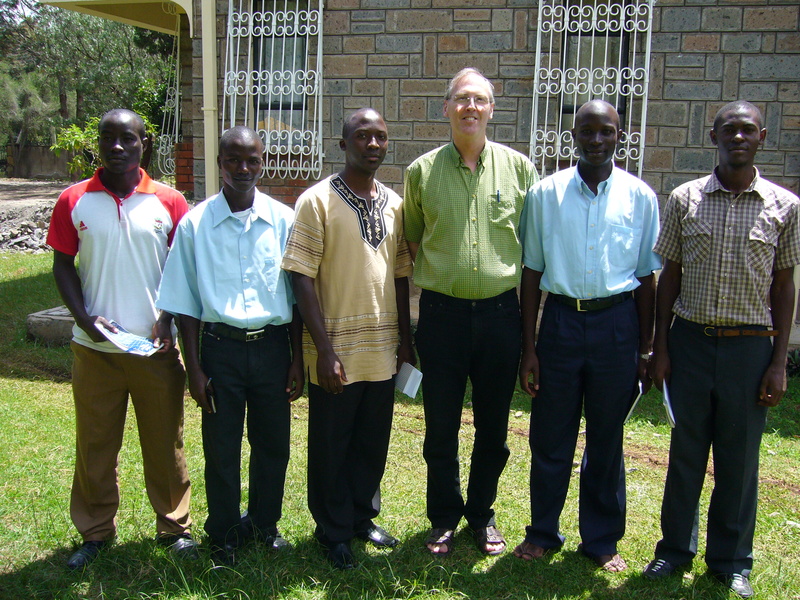 l to r. Brian, Joseph, Boniface, Fr Stephen, Stephen, Michael & Acheleo. Let us pray for them all. 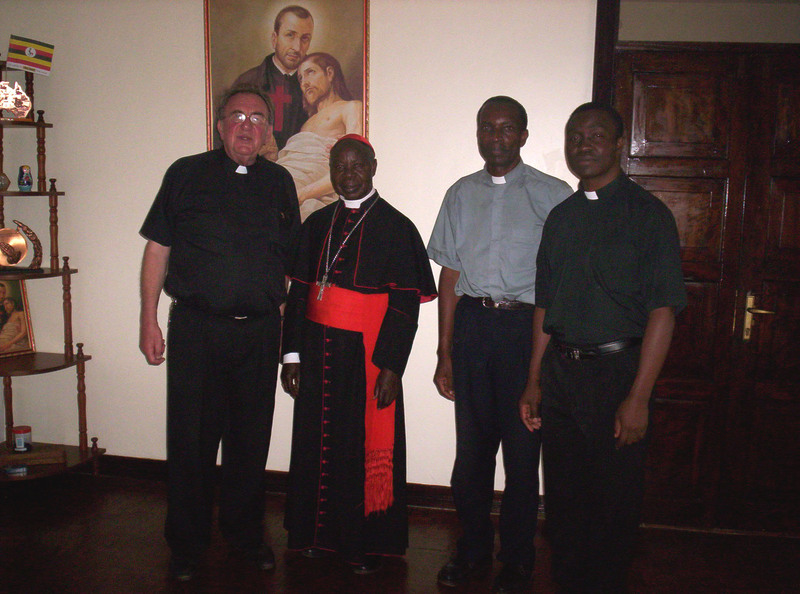 The Bishop of Jinja with the Camillians. 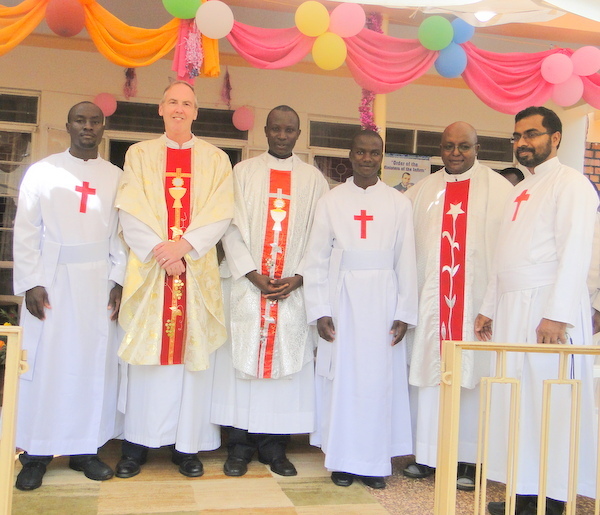 l to r Fr Shibin, Fr Johnson, (both Indian Vice Province) Fr Renato Salvatore, (Superior General) Fr Stephen Foster, (Provincial) Bishop Charles Wakima & Fr Tom Smith (Superior & Delegate). 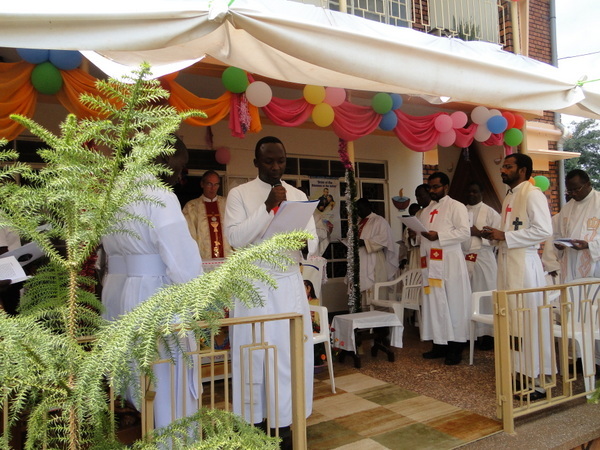 Outside the St Camillus House in Jinja Uganda. Frs Johnson, Stephen, Renato, Shibin, Tom & Bro. Luca. 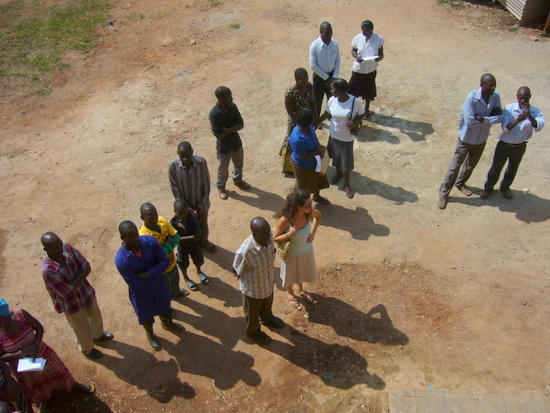 January 2011 Second Phase in the Uganda story. The Anglo-Irish/Indian collaboration lays down roots. 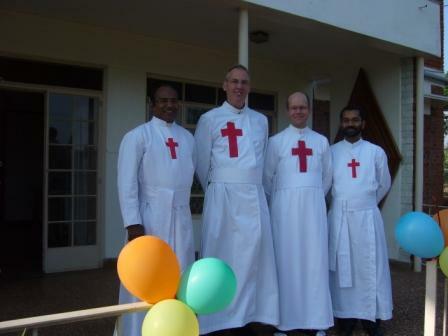 Frs Johnson, Stephen, Tom & Shibin. 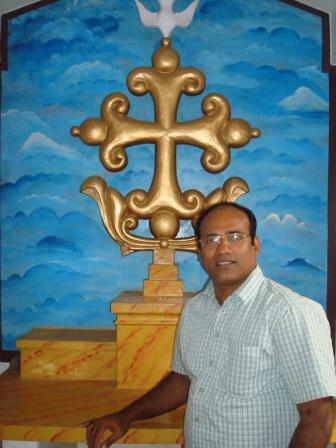 Fr Shibin, arrives Tuesday August 3, 2010. Welcome!!! 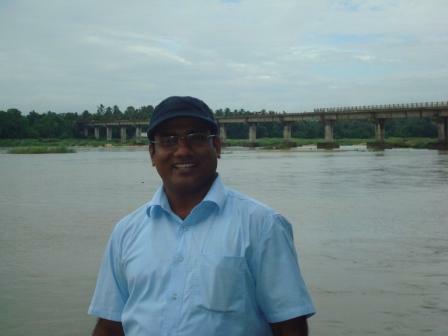 Fr Shibin Apparthanathu near his homeland in India before he left. 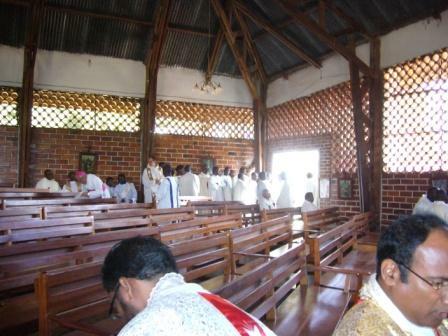 Fr Mathew Perumpil accompanies him. 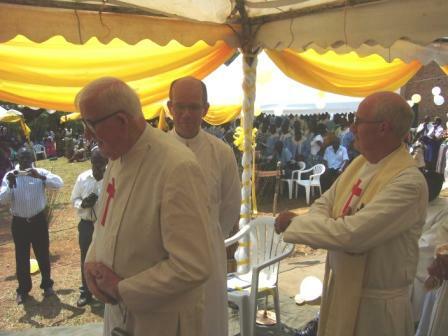 The two Fr Toms in Mukono prior to the arrival of the Indian Camillians. 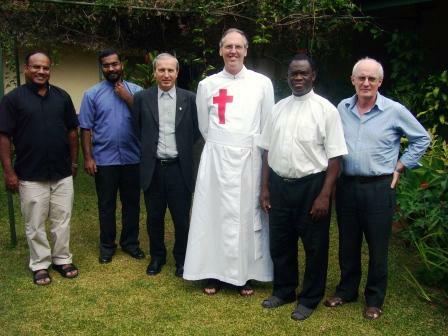 The Group on the day of Fr Stephen's departure, 22 March 2010. 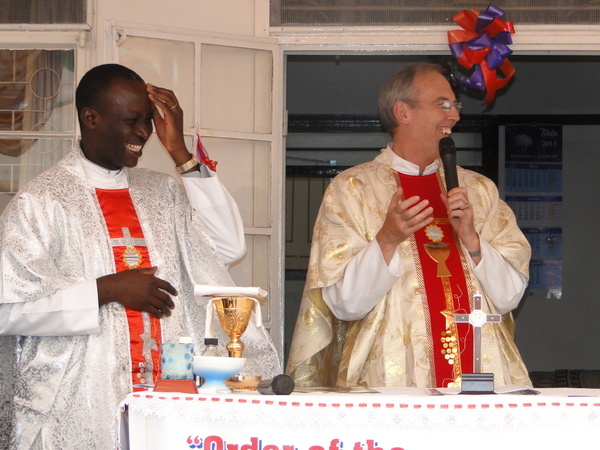 Frs Johnson & Mathew left the following day for Nairobi where they will meet our students and fellow Camillians. 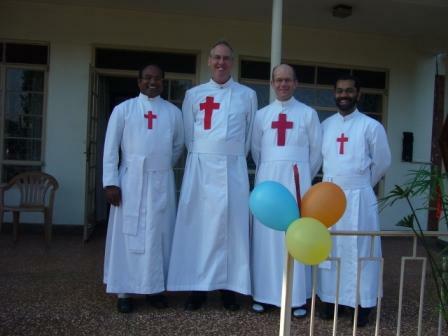 Fr Mathew will return to India on the following Saturday and Fr Johnson will return to Jinja during Holy Week. Srs Wincy & Mercelan from the Queen of the Apostles Congregation. Our neighbours in Jinja since 2007. They are both from Kerala, India. 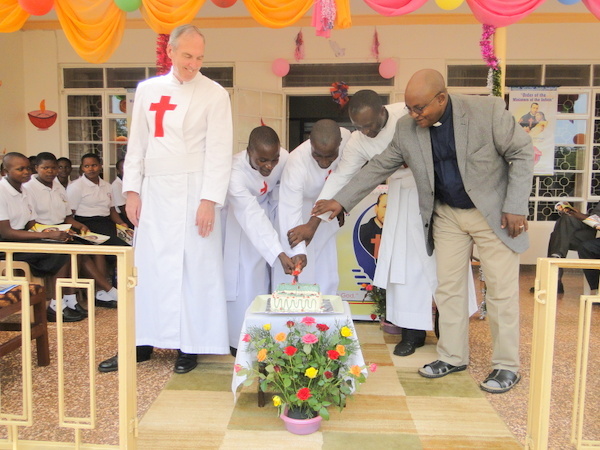 From the launching or our Mission in Uganda in October 2000 this March will be regarded as an historic month in the development of the Mission and in its future. 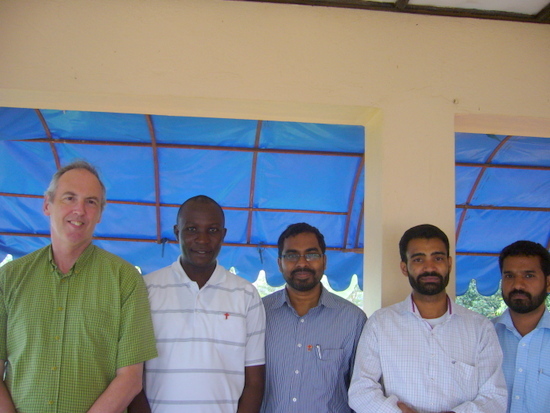 From March 19th to 23rd we had a meeting here in Jinja between Fr. 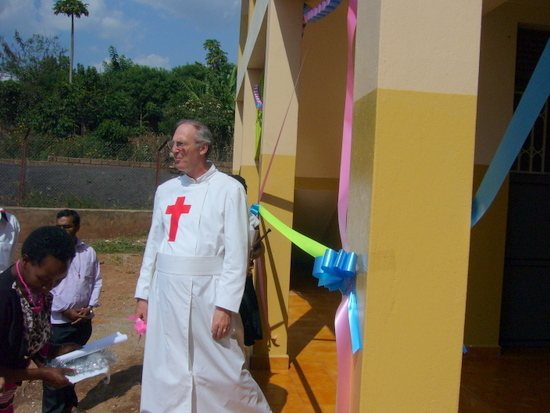 Stephen Forster, the Provincial Superior of our English-Irish Province and Fr. 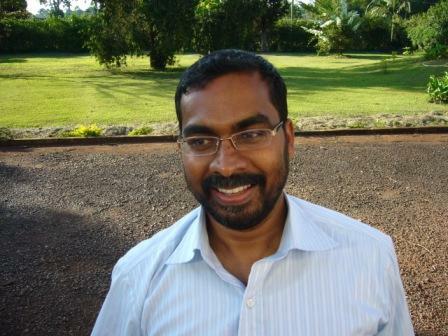 Mathew Perumpil, head of the vice-Province of India. The aim of the meeting was to finalise collaboration between the two groups of Camillians (Ireland and India) for the betterment of our Mission and its future in Uganda. Along with Fr. Perumpil we were delighted to welcome also Fr. 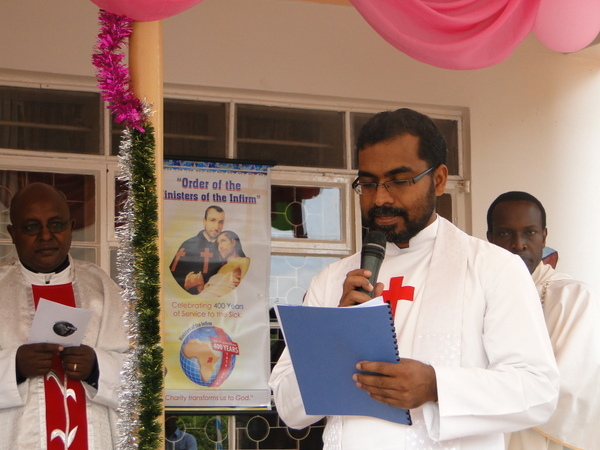 Johnson Vellachira the first Indian Camillian missionary to Africa and Uganda. Our meeting was the outcome of intense communication over nearly two years of dialogue and communication between the two groups. At the moment and for the foreseeable future there are no vocations in our home Province in Ireland to continue the life and development of our Mission. 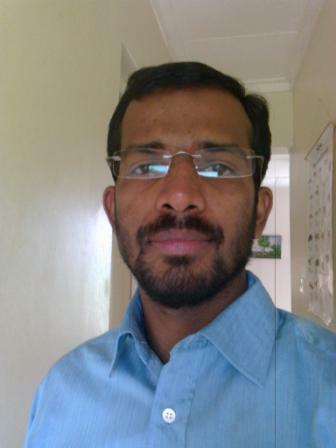 On the other hand India is blessed with an abundance of young Camillians who in turn are blessed with a missionary spirit and keen to undertake the challenge coming from Uganda. Fr. Johnson is the first of these new missionaries. Fr. Mathew assures us there will be many more to follow. Our meeting dealt with the basics of any Camillian mission: firstly, a hands-on care of the sick especially the sick poor and secondly, the promotion and training of future Ugandan Camillians. These have been the two pillars of our Mission here since we arrived ten years ago. Those ten years have taken their toll in the lives of Fr. Smith and myself and the future naturally has forced us to look for support in the form of manpower from a young and thriving Camillian community in India. For the past twenty years now the decline of missionaries belonging to various Orders or Congregations from abroad has been all too evident. 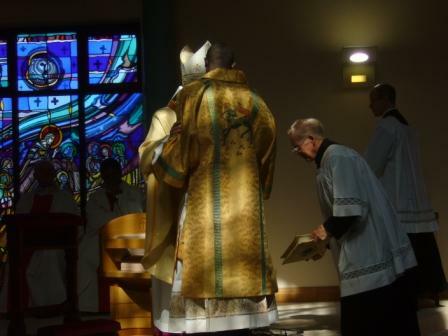 So much so that without a follow on from local vocations, the specialised charism and ministry simply dies out as the project is handed back to the local diocese. 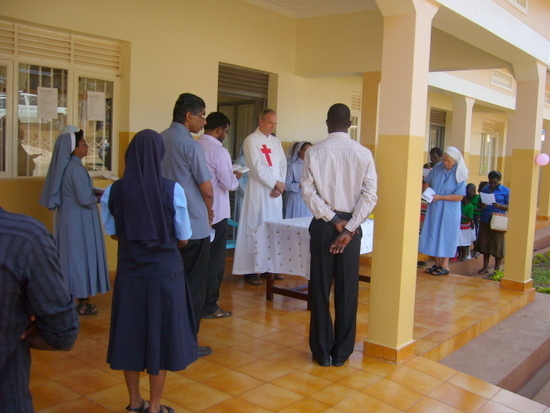 In 1990 there were 30 Mill Hill Missionaries in the diocese of Jinja. Now only the Bishop, a Dutch Mill Hill man, remains and he has already retired. Recruitment and training of local vocations did not go a pace with the decline due to age, sickness and retirement back to Europe. Thus the famous Mill Hill missionary spirit and drive has gradually died out. Nor can it be otherwise as the diocesan Bishop and clergy cannot be expected to repeat what is after all a specialised role and ministry. 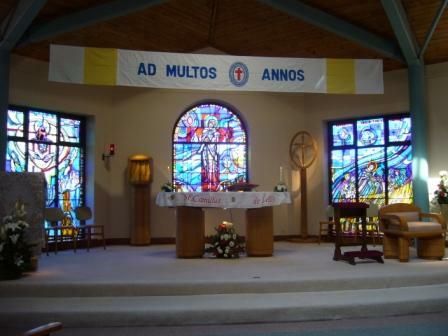 Twenty years is scarcely enough to expect local vocations to the Order or Congregation to be recruited and trained to take over from the original missionaries. 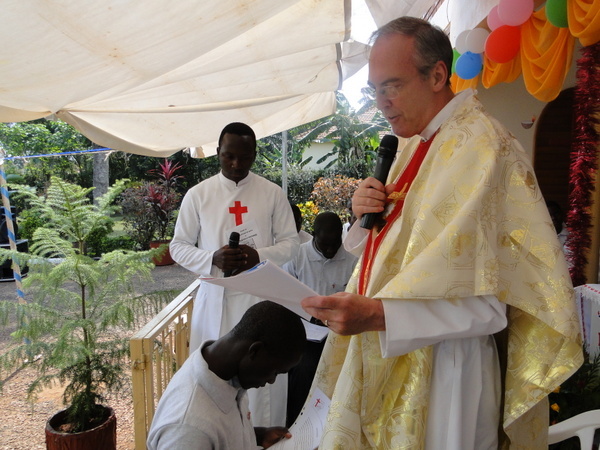 In our case, though we have seven seminarians, a number of years will be needed before they can be expected to carry on the very specific Camillian ministry and service to the sick. And that includes the presumption that they persevere! 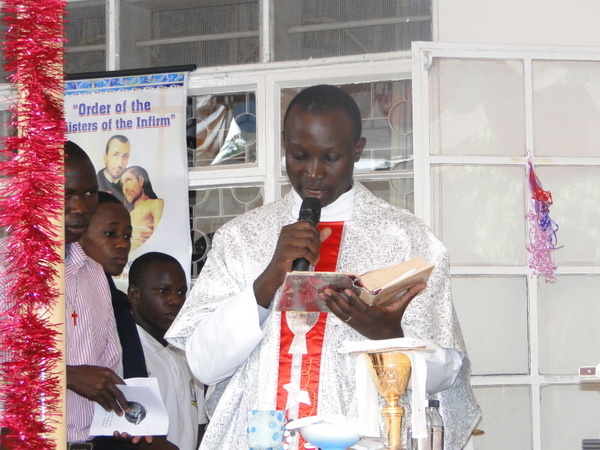 Only four out of ten starters in Uganda persevere up to final pofession or Ordination. 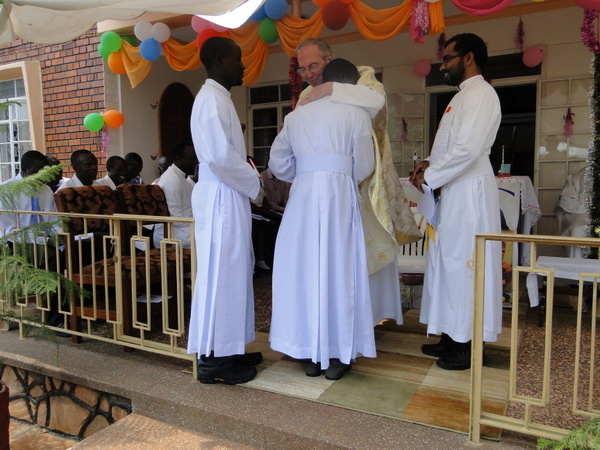 Needless to say we look forward to Ugandan vocations taking over this Mission in God's good time and indeed spreading the Camillian ministry in new foundations beyond our borders thereby becoming missionaries in their turn. 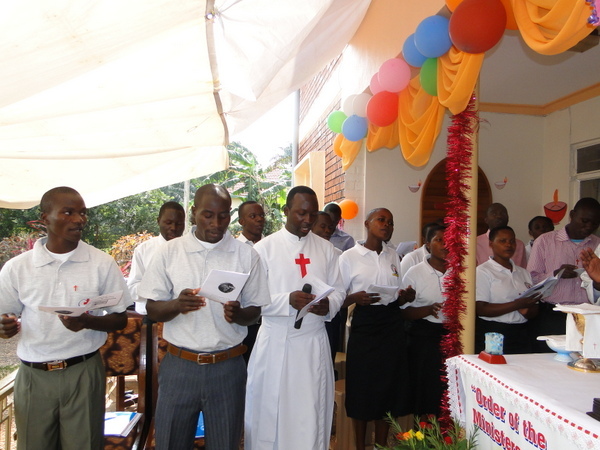 Another twenty years should be enough to animate the local church here by example and teaching and have ALL of our Ugandan Camillians leave their own country to found Camillian communities in neighbouring countries like the Congo, Rwanda and Burundi. That's how it should be where missionaries have no permanent abode but are on the move to trumpet the Church and specifically in our case, the Camillian care of the sick. What if St. Patrick hadn't left home to come back to evangelise the Irish and then produce men like Columcille ofIona and his disciple Columbanus who founded monasteries in England, France, Belgium, Germany, Switzerland, Austria and Italy. Why not Uganda to camillianize countries all across Africa? Someone said: "It is people of hope who plant seeds". A good missionary friend of mine here put it another way: "A true missionary is never too far away from his suitcase." And so, Uganda can rejoice and you, dear Reader, along with us. 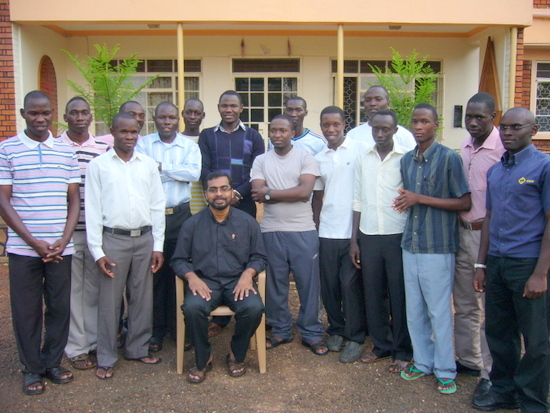 The youthful enthusiasm of our Indian confreres - now missionaries to Uganda - fills us with hope. The dialogue between our Superiors has reached its desired aspiration. Over the past two years many of you have been praying for this success. The timing is right. Thank you for your prayers. It is a happy and very meaningful coincidence that the arrival of the new missionaries takes place as the Heart of our Founder St Camillus (he died in 1614) arrives in Ireland to be a blessing for the sick, their family members, their carers and our many benefactors. 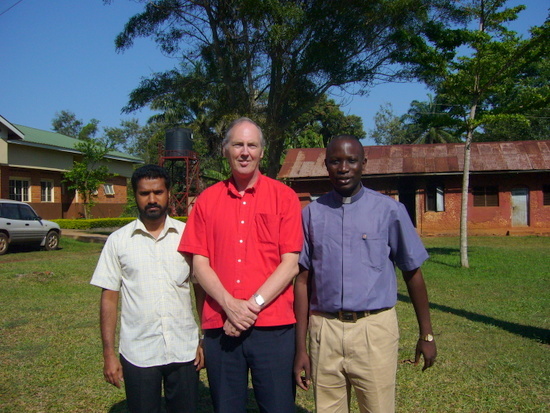 Fr James travelled with Fr Stephen Foster from Kenya to Uganda by car last Saturday, 30 January, 2010. It was a journey from Tabaka, through Eldoret and crossing the border at Malaba. Whatever you do, don't cross the border at Malaba. It's a nightmare of beauracracy and inefficeincy. They then travelled after being held up at the border for 90 minutes to Jinja where they arrived at 1130 pm, Saturday night. 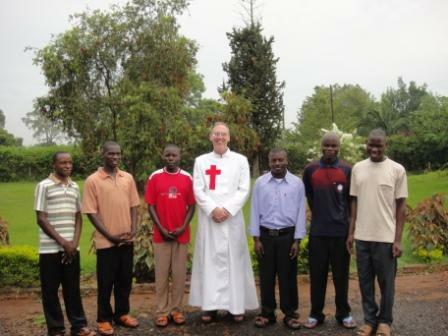 NAIROBI KENYA - here we see Fr Stephen in Nairobi, Kenya with our five Ugandan students who are training at our seminary there. We have 44 students there at present at various stages of formation. Thank God for his blessings to us. Our other Camillian students are from Kenya and Tanzania. I arrived in Nairobi on Thursday morning the 21st January at 09:15 quite wrecked. The air traffic controllers dispute in Dublin conspired to put an extra number of hours on the schedule that were definitely not wanted as well two last minute changes of flights because of their sudden industrial action. 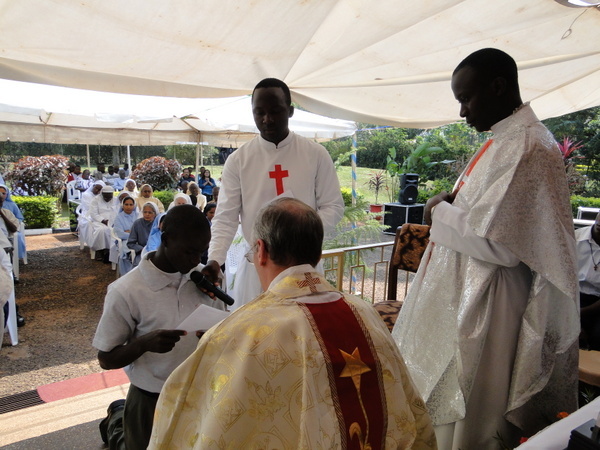 I was collected at Nairobi airport by Fr Richard who had only been ordained the previous month. At the coffee break that morning I met the Delegation Council who were meeting that morning. I was taken by Fr Hubert, (Tanzanian Camillian) the following morning to the Karen Blixen museum. I must say I had never heard of her and didn’t learn much of her as we could not enter the museum as neither of us had any money. Well, he none and me, not the right kind. 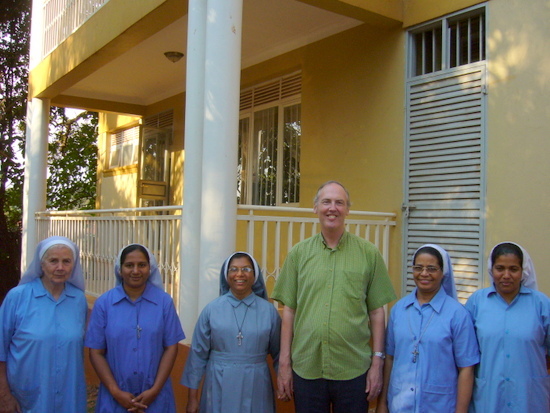 We then proceeded to meet the sisters of St Camillus who gave us a hearty welcome and a nice cup of coffee. They regaled us with many tales about Brother Camillus whom they all love and were very disappointed that he did not travel with me as had been expected by them. My first official assignment was in the afternoon to give a talk to the philosophers as they are called. I stayed for an hour and spoke to them about the Camillian charism and St Camillus. That evening we had Mass for all on campus followed by supper together. Normally the philosophers and theologians (as the theological students are named) have separate routines. Saturday began with morning prayer and Mass for the theologians followed by a talk at 9am. At 11:30 I was delighted to meet ‘our students’, i.e. the Ugandan students who belong to our Province. Richard, whom many of you know, is in his final year of theology which he will complete in May. 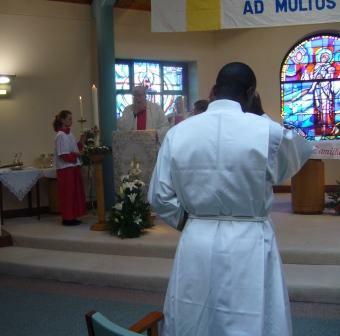 He then begins his Pastoral Year after the summer break and he will be due later this year for Solemn Profession with ordination to the diaconate shortly after. He will be ordained a priest please god in the summer of next year. Boniface is in 2nd year philosophy and will be due for novitiate in September next year. The other three students, Brian, Joseph and Acheleo are all doing their first year of philosophy and would be due for novitiate in September 2012. Here they study three years of philosophy. So I was happy to meet them and bring the Province’s greetings to them. 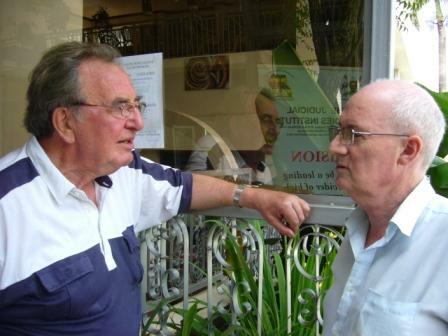 Later in the afternoon I met Richard privately and also Boni (Boniface). 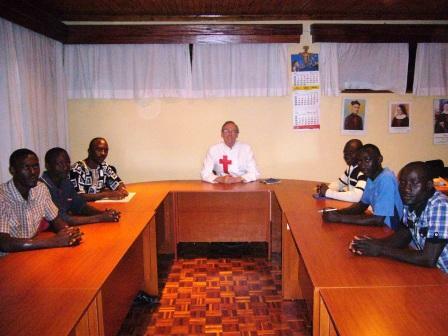 After meeting Boniface I was taken by Fr Hubert to Bolech House in the city where the other Nairobi community resides. Before that he took me to the Basilica. Most impressive. At the community I met Fr John Misoto, an old friend of Camillus, Brother Albano, who was passing through from Tabaka and Brother Moses, one of the students in his pastoral year. They told me Bro. Gabriel lived here for 5 years. Sunday morning saw me being interviewed by Fr Richard for the Kenyan newsletter. Fr Richard is the Vocation promoter. 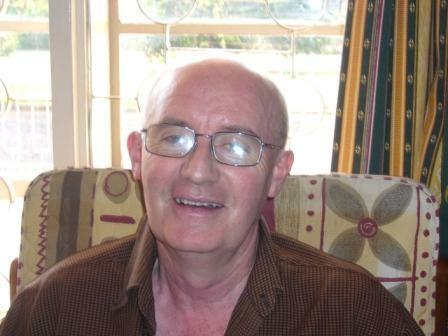 He was assisted by Brother Stephen, who told me he wants to come to Ireland to do CPE. 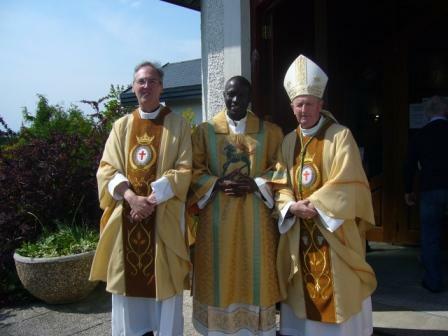 After this Fr James Wanjau, Provincial Delegate accompanied me to 11:00 am Mass in the parish. It was a most colourful and joyous affair. The women were full of bright colours and the singing was heavenly. 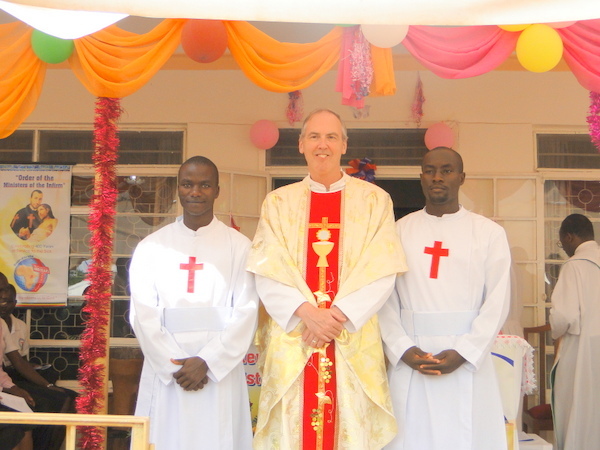 That afternoon saw me leave for Nkubu with Fr Richard and Patrick, an I.T. technician from Tabaka. This was a long journey but it gave me the opportunity to view the beautiful Kenyan countryside. We also stopped on the way to meet a vocation candidate, Joseph, who has been accepted for the March to June orientation course. We met his mother and family who gave us tea. 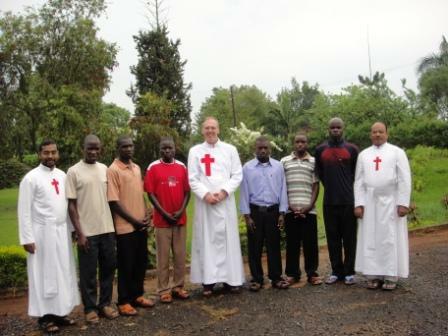 We also met, by accident or providence, the local Bishop of Embu, Paul kariuki. 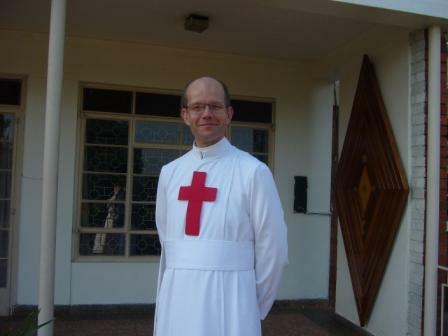 He was young, only 47 and only ordained in 1993. 16 years a priest and then made Bishop. We didn’t arrive in Nkubu until 8:45 pm where I was dropped off as the other two had to journey on to meet another vocation candidate whose family had agreed to put them up for the night. I wouldn’t have thought there would have been room. The next morning began at 6 when I awoke for the 6:30 Mass. 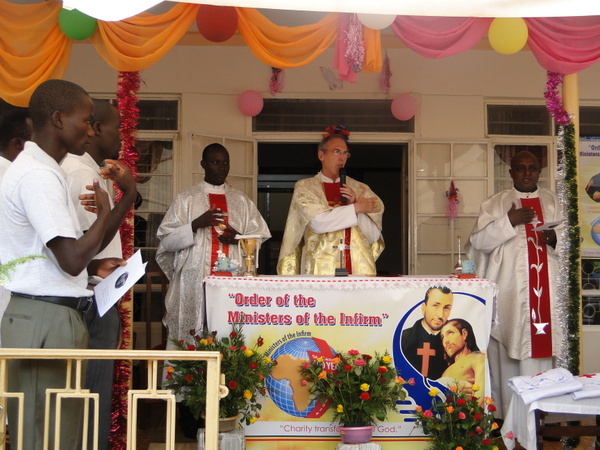 I celebrated and the administrator, Fr Joseph Prosepio, known to some of you, concelebrated. It was a lovely Mass with beautiful singing. I just could not imagine the same in Ireland at 6:30 n the morning but one never knows. 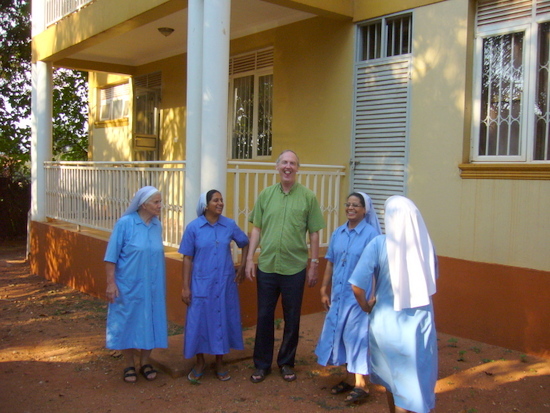 I met 3 Indian Sisters after Mass who are working in the hospital. One is a doctor. She told me the hospital would really benefit if they could secure the services of an orthopaedic doctor. 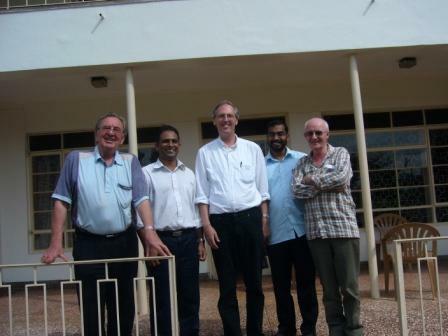 After breakfast I toured the hospital with Fr Joseph and left after lunch with Richard and Patrick who had arrived by then and we headed back to Nairobi. Tuesday was a free and easy day in Nairobi. Up at 6. Left at 6:35 with James to go the Sisters for Mass. A lovely Mass was followed by breakfast. We headed back to the seminary and then left on our journey at 9:45. We stopped for lunch at some barbecue place near Nukuru. Then we headed on and stopped at the tea hotel at 3:30 at Karicho. After tea we headed on our journey arriving eventually at Tabaka at 6:00pm. Then we had prayer at 6:45 followed by 30 minutes of meditation. Supper afterwards with the community and hospital doctors. In the afternoon I left with Brother Albano for Kurungu. About two hours journey, but a terrible road. Thank God I would not see this road again. Little did I know. I arrived quite battered at 4:45 after such a bumpy journey and took two panadol and a coca cola. Dinner at 8 with all the gang. The Camillian Community and Hospital in Kurungu is located on the shores of Lake Victoria and it really was quite beautiful. 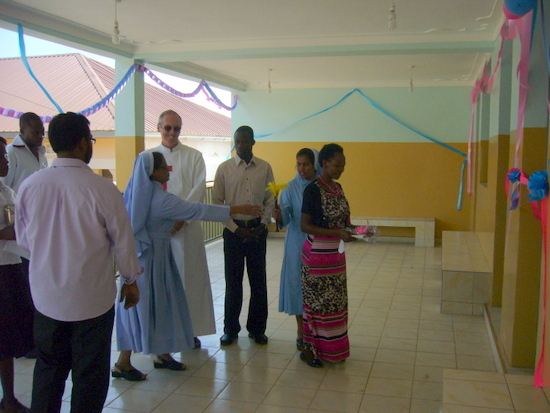 Fr Emilio Balliana, Superior and Director of the Hospital showed me around the complex. It’s quite built up. I also learned that the following day instead of heading for Jinja in Uganda asoriginally planned, I now had to go back to Tabaka, before proceeding to Jinja. This was because James was having problems with his vehicle and thought it better to stay in Tabaka and get it checked. I left at 6 am from Kurungu and travelled to Tabaka with Boniface our driver, Angie and Kayla, two volunteers from overseas who were helping the Camillians in Kurungu. We arrived at Tabaka at 8:10. We had coffee and left at 9 for Kisii. We bought car oil and then went to visit the local parish priest. At about 1045 we departed for Uganda. This was a long journey. We stopped off twice for breaks and did not arrive in Jinja that night until 11pm. We crossed the border from kenya to Uganda at malaba and what a nightmare this was for tired travellers. 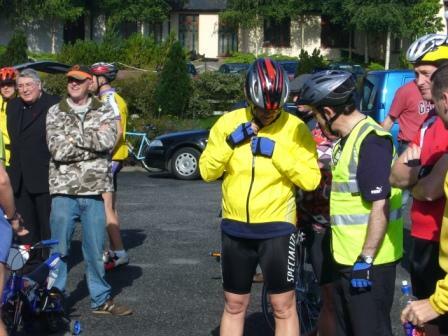 Incompetence and beuracracy were the name of the game at this checkpoint and bribery was welcomed. It took us 90 minutes to cross the border. If there’s a next time it will be by plane. At 9 30 I met Michael, a vocation candidate who has been accepted for our orientation programme in Nairobi beginning in March. 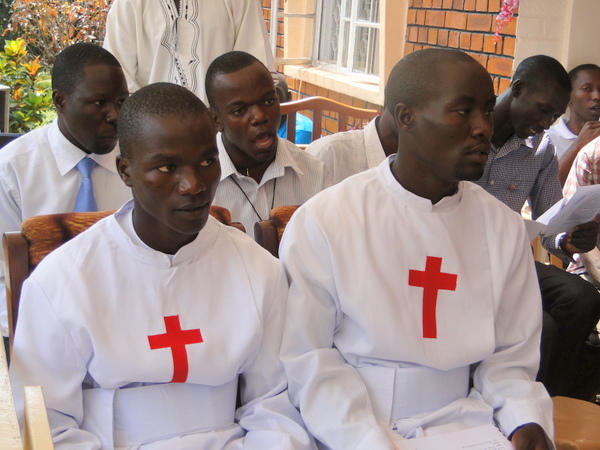 At 10 am I met Stephen, the second vocation candidate who will accompany him and they will the two Ugandans out of the ten postulants accepted for the programme. Mass at 11 was celebrated for us by Fr James. After Mass Stephen and Michael left for Kampala. 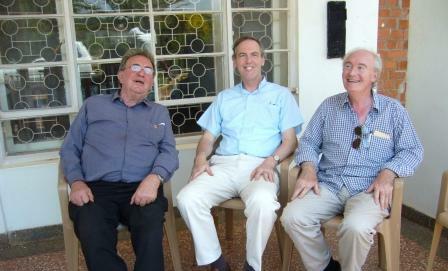 The four of us, Tom O’Connor, Tom Smith, Fr James and I headed for lunch outside by the lake. It was a beautiful setting. I checked my email for a printout at the Jinja Philosophicum. That afternoon, I met a number of people who wished our Province to consider a health care project proposal. Spent the morning with the two Frs Tom and then headed for Kampala in the afternoon with Tom Smith. As a result of the evening rush hour in Kampala it took us approximately 4 hours to arrive at our destination a few kilometres short of Entebbe airport where we had an evening meal. I left Uganda shortly after midnight. Fr Stephen with the simply professed Camillians and novices. 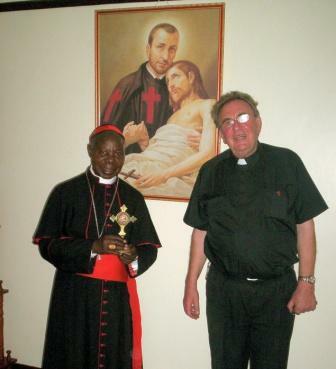 above - His Eminence Cardinal Wamala visits our house in Jinja. He is pictured here holding a relic of St Camillus alongside Fr Tom O'Connor. 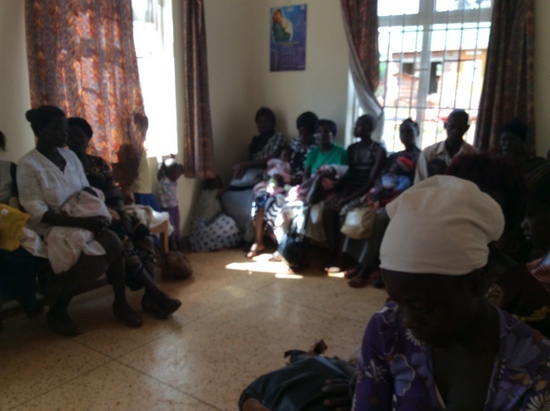 Our Mission in Uganda is located in Jinja. We began in 2000. Just down the road from here there is a village in the bush called Bukaya. There is a large area of land owned by the local municipality. The local people have been gradually moving into that area cultivating plots for themselves here and there. The local council do not seem to object. After all there are thousands of these unused acres now being occupied by the neighbours and indeed by people from outside the area. Last week a local woman went out as usual to dig in the plot she had taken for herself. As usual too she took her three year old child with her. In the early morning she was brutally killed for human sacrifice. Her head, breasts and private parts were removed for some witch doctor for a client who sought protection or favours from the spirits. Neighbours went to the scene when they heard the child crying and calling for his Mom. People in the area say that this is the sixth such killing over the past year so much so that the area has since been abandoned. Large sums of money are required for human sacrifice as the witch doctor knows how to target the rich. With this in mind I thought I would share again an item I wrote on witchcraft for Mission News back in September 2001. But as you can see, however much the converted witch doctors try to educate and enlighten the people, the culture of witchcraft remains deeply embedded in their minds and hearts. The poor woman down the road is ample proof of that. Even members of parliament consult witchdoctors! Which witch … Whither witchcraft … in Uganda? At the beginning of the month the DAILY MAIL carried an article with the heading ‘Christianity nearly defeated in Britain’ The writer was quoting Cardinal Murphy O’Connor who was speaking to a large group of priests and declared that “Christianity in England and Wales has now almost been vanquished”. The leader of the church went on to say that people are turning to New Age and occult practices for glimpses of the transcendent and in an effort to find meaning in their lives. It is in line with a recent similar statement by the head of the Church of England Archbishop Carey that “tacit atheism is now mainstream thinking in Britain”. It is most interesting to read these statements from a standpoint of Uganda or indeed that of most of the 54 countries that make up the African continent. Here, we are trying to deal with the switch from paganism and the occult to the practice of the christian faith. That’s no easy task. 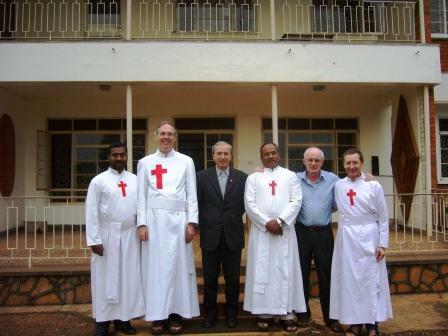 In Uganda for example the first christian missionaries arrived only a little more than one hundred years ago. Even after fifteen hundred years of christianity, reference is still made - often very seriously - to piseogs in many parts of Ireland. What is in culture is deeply rooted. The Collins English Dictionary defines the occult as characteristic of magical, mystical, or supernatural arts, phenomena or influences. Based therefore as it is on ignorance or non-knowledge, the occult induces and produces fear and it is this fear that keeps witches and witchdoctors in business. When christianity came to Africa, still more spirits were introduced: heavenly spirits called angels and evil spirits called devils or demons adding to what was already here in the occult. I couldn’t claim competence speaking about possession by evil spirits, the working of the devil or the goings on in the black arts, sorcery, witchcraft and the like. On the one hand exorcism is practiced fairly regularly here. On the other hand I have got to know a seasoned Dutch missionary who assured me that in over 40 years he had never seen or heard anything that could be declared as coming from Old Nick! But the Church, especially in the charismatic movement, local priests thrive on exorcisms! At the weekend, we had a study day here in the parish church of Nyenga (pronounce knee-en-gah). The topic was witchcraft and the presenters were all ex-professionals: four witches and six witch-doctors. This was the real thing from out of the real thing! Jam and jam up on it as Eamon Kelly puts it. They began by giving a brief account of their personal history. “My name is Norman, I’ve been a witchdoctor for 25 years”, “My name is Kate, I’ve been a witch for 18 years”. They were all very keen to tell their story as it was. In fact they were just ten out of more than 500 men and women who have abandoned the ways of witchcraft and are preparing to become catholics. 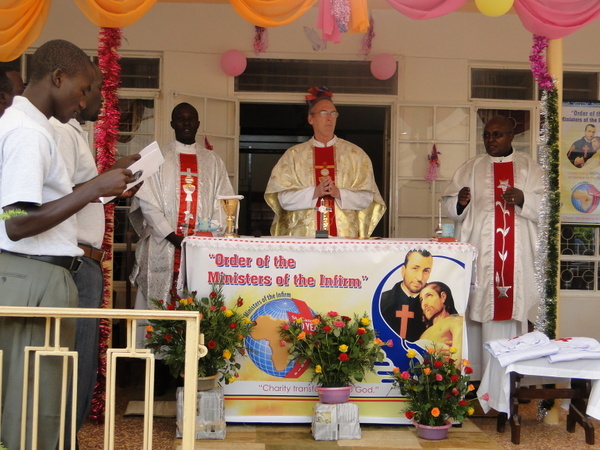 Grunts, groans and growls ... An Italian Comboni missionary who is out here since 1947 began this rather unique branch of ministry – the conversion of witchdoctors. The group is on a tour in our diocese at the moment. They certainly looked the part with their headgear of feathers, skins and furs along with an array of the symbols of the trade like animal horns and hoofs, an assortment of rings, buttons and strange looking items of trinketry. Their aim was to teach the audience that witchcraft was nothing more than trickery preying on the cultural fears of the ignorant, the poor and the sick. 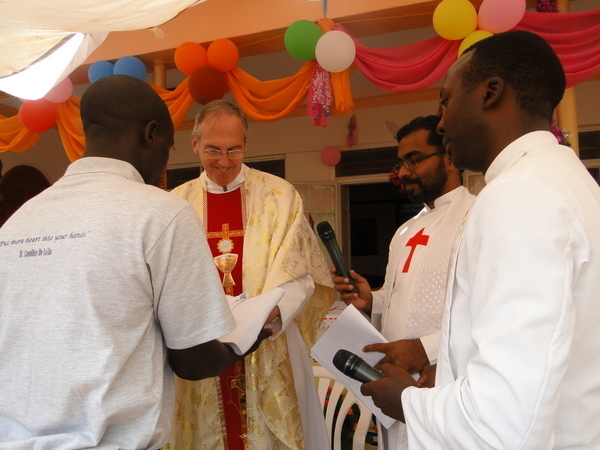 They did not speak our local dialect, but they had a priest who gave a running commentary. However the grunts the groans and the growls of the witchdoctors and witches were original and very effective in creating the necessary atmosphere. Charm number one ... more to follow ...Throughout the day they went through four exercises showing us in vivid detail what actually happens at a witchcraft performance. One of those exercises consists of a “diagnosis” of charms infesting the body of the client causing the sickness, the pain or whatever other kind of misfortune the client was experiencing. 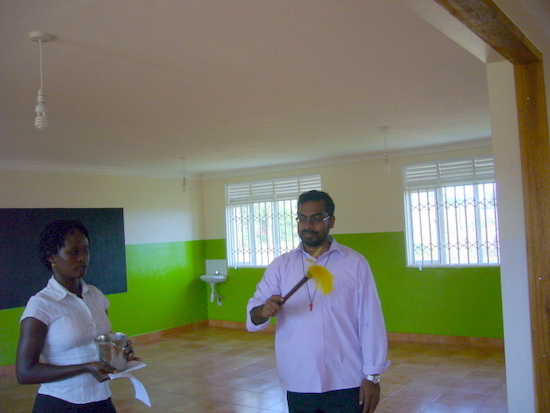 They then demonstrated how the witchdoctor could extract these charms from various parts of the body. A sharp bite on the “affected area” and hey, presto, the charm would be in the witchdoctor’s mouth having been “sucked” out of the body and dramatically shown to the client and carefully put on display. Charm number one; more to follow. The so-called charm is a little piece of stone smaller than a marble and a client could have as many as fifteen of these “extracted”. The trick was that the little stone had been in the witchdoctor’s mouth from the start. The sharp bite was meant to simulate a surgeon’s knife and the amazed patient would be left with no incision even though the charm or charms had all been extracted. Progress? What progress? ... While the rich and powerful in Britain may be turning to the occult and New Age according to Card. Murphy O’Connor, the poor as well as the powerful in Africa are still quagmired in the pagan traditions of their ancestors rediscovering and practising witchcraft with all its weird and horrendous effects on life while preying on the poor and the ignorant. 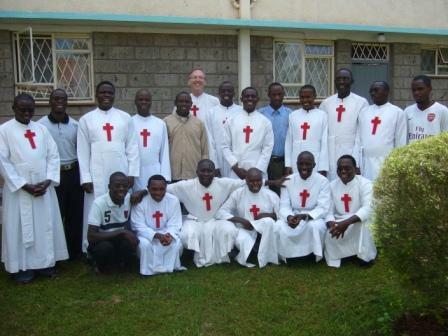 On 7th last ... we had a party for the seminarians going back to Nairobi after their Christ-mas break. We were joined by two new prospective candidates who were able to benefit from the encounter with their peers who are already in the seminary. The party however was not all jollification though fraternity characterised the encounter. 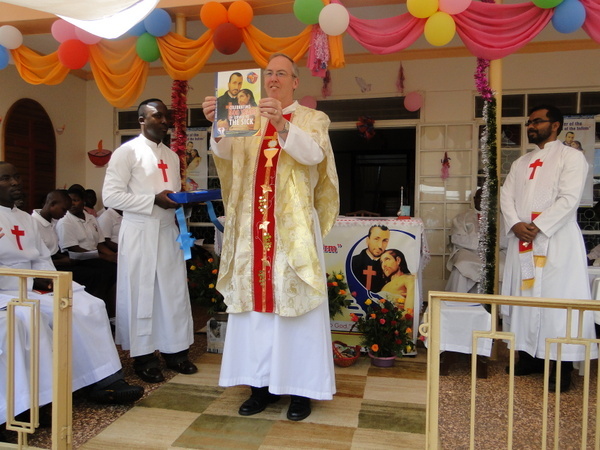 We had a one hour sharing on the following three question: a), What I believe I am good at to be a Camillian priest or Brother; b), What most impresses me about St. Camillus and the Camillians; and c), Where I think the Camillian ministry should concentrate on today in Uganda. The hour’s discussion was spent mostly on question and answer as to the full meaning of each question. The personal discovery of an authentic response to questions a and b is what will make a success of the community response to question c. The “who am I?” question is central to every vocation especially throughout the various stages of basic formation and training. The overall aim of the sharing was that the three questions remain the topic for regular meetings of our Ugandan students in Nairobi for the year ahead led by Bro. Richard Lubaale, our senior student. A hoax or a sick joke ... With the eyes of the world glued to the awful destruction of the earthquake in Haiti, a person or persons unknown pretending to belong to a scientific institute in Ghana declared that cosmic rays from Mars were being released and would bring about a Haiti-type earthquake across the country. The people panicked as news spread by mobile phone and even nationwide local radios. People rushed from their homes and buildings gathering up their bits and pieces and getting them-selves to open spaces for safety. As fear and terror grew among the people the government and the scientific world were unable to clarify the report one way or another. Eventually as nothing happened and the people discovered the whole story was either a joke or a hoax gradually returned to their homes, all was well again. The authorities were unable to identify the origin of the scare that cosmic rays were about to strike Ghana with devastating results. An April fool in January?! As if to set the tone for the new decade, our Superior Provincial, Fr. Stephen Forster paid us a very welcome visit. 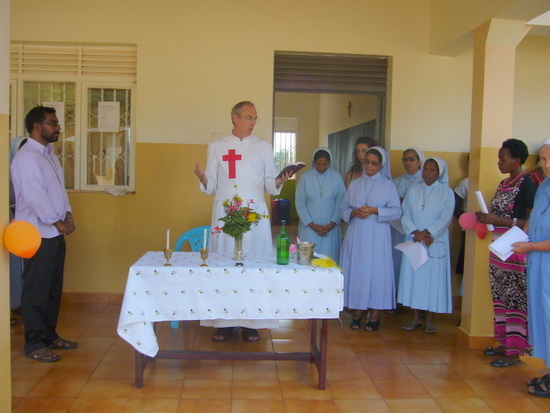 He was on an official visit to the Camillian Mission in neighbouring Kenya and was able to fit in a few extra days to cross the border by car along with the Kenyan vice-Provincial, Fr. 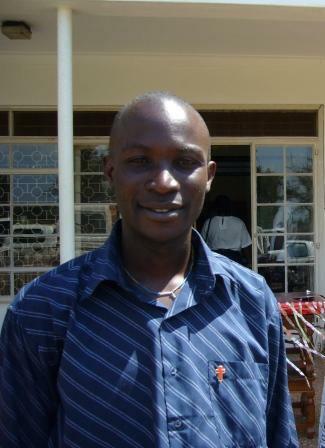 James Wanjau. 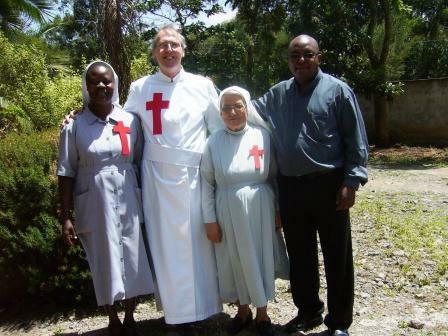 In Kenya, along with visiting the four communities, Fr. 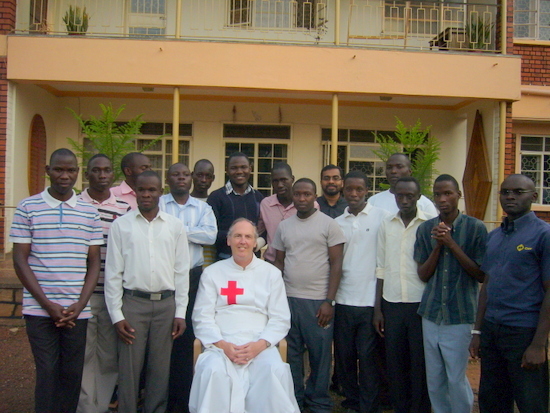 Stephen was able to spend quality time with our Ugandan seminarians as a group and individually. 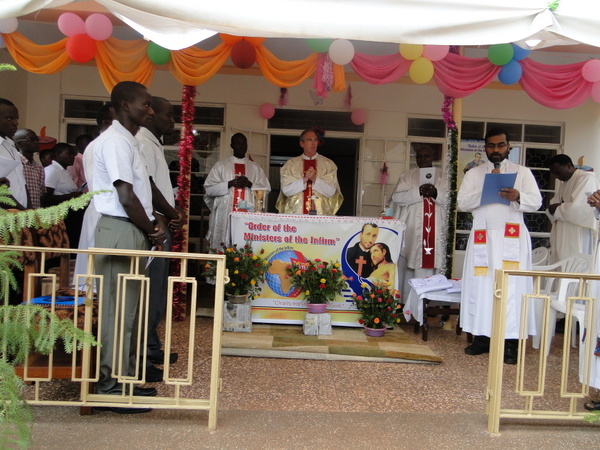 Here in Uganda he was able to concentrate attention on the imminent arrival (in May) of our Confreres from India and their takeover of the Mission projects in Jinja and Nyenga. Thinking of the flood, frost and snow of the past weeks in Ireland, could anything be a more welcome change than to experience the perfect climate we enjoy in these parts of Africa. Thank you Steve for your visit, your lively company and your encouragement! Our prayers and good wishes to one and all for a blessed and fruitful New Year. Call on God for help but row back from the rocks! There is but one easy place in the world, that is the grave! Out of the many Christmas cards that come our way carrying greetings of the Season, usually a few stand out for the original image and its message. Among the cards I received this year was one that was packed with originality and creativity. Under the headline “Unto us a child is born ...”, it carried a cover photograph of a three year old child called Emmanuel standing inside three stacked up used car tyres and smiling out at the camera-man. The caption says: “Emmanuel was born in Uganda. He has spina bifida. The tyres are used as part of his physiotherapy to teach him how to stand on his own.” With a name like that of the Saviour he looks like he is ready to own Christmas having it all to himself. With the help of the tyres, he oozes self-confidence taking on the world with a big broad smile that seems to say: “Here’s me, the champ, who’s like me?” The card was produced by the Chigwell Sisters (Sisters of the Sacred Hearts of Jesus and Mary) whom we know so well from the Homerton/Hackney days. 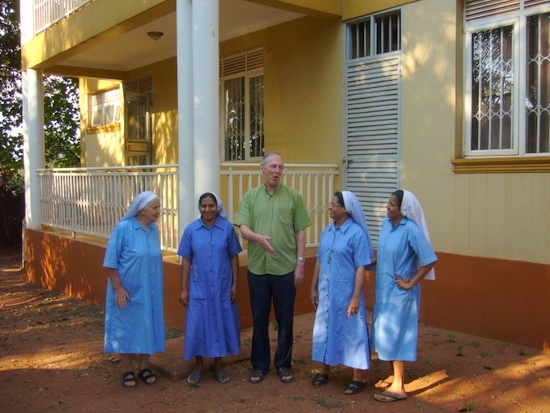 The proceeds from the sale of the cards are destined for their Missions as the Sisters work “wherever the need is greatest”. It is a fine piece of publicity for the Congregation and excellent vocation advert as well. “Keep the smile, leave the tear, think of joy, forget the fear. Some people just have the knack, and what is more, the heart that goes with it in optimism and self confidence. The Power behind us is ever greater than the challenge in front of us! Floods first, now frost and snow ... Ireland would seem to be at the epicentre of climate warming, or cooling or whatever it is that the world experts continue shouting at us from Copenhagen to Clonmel. It brings to mind the helplessness of human expertise and the folly of self-styled enlightened atheists. Years ago in Rome when the country was wracked with strikes someone got the idea of producing a newspaper to inform the public about the strikes that were current or pending, those that were blocked in negotiations and those that were about to begin. People were delighted that now at least you knew where you stood. But then after about a month of bliss the newspaper itself went on strike! As for the terrible floods, frost and snow the whole world for once can be genuinely jealous of Uganda and the perfect climate we have all year around. T-shirt weather I call it for that is what it is. Always warm but never sweltering, cool but never cold. Snow would be just as impossible as an iceberg would be down the road in Lake Victoria. President for life ...? Just before Christmas the leading political party in Uganda, “The Movement” voted to present the incumbent President Musevani as its candidate for the presidential election in 2011.Though multiple parties have recently been allowed, none of them could have a chance should Musevani accept to run for what will be his fourth consecutive term. Will it be a case of president for life? Without doubt he has done an excellent job here at home and is highly regarded abroad. But in Africa we have to learn from the experience of country after country ending up with a president for life. Yes they all talk the talk but walking the walk in a truly democratic fashion is another thing entirely. Vocations on the rise ... The year has ended with two for sure and possibly a third potential candidate. That brings our number to eight setting out on the new scholastic year next August. But the saying ‘don’t count your chickens ‘till they are hatched’ would seem to apply very specifically to Ugandan potential candidates as experience has taught me over the years. 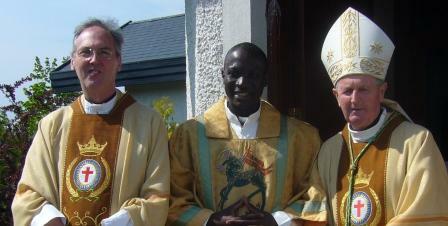 Meanwhile Richard Lubaale, well known to all in Killucan, will have completed his theology studies by next May. 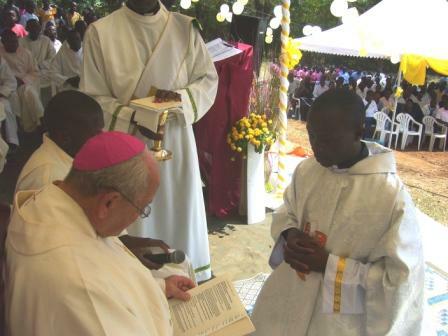 His priestly Ordination - the first Ugandan Camillian priest - will follow within a year of that. More than enough to have us all thank the Lord and the many benefactors and supporters who follow us with their prayers. Thank you dear Reader. Wishing you every blessing for the year ahead, the tenth of our Mission here. “Don’t look down on anyone unless you are helping them up." Christmas and Christmas cards ... It was nice to have my Christmas wishes posted for me in Ireland. That way I avoided the Snail Mail, a big part of the uncertainties in Uganda. Our postal service is little used by Ugandans. On account of the fact that we have no postal delivery, you have to rent a post office box. That is seen as useless expenditure by Ugandans who have no tradition of letter writing in any case. Nor do they have Christmas cards here. This year I had only very few cards left over from last year and the person who very kindly supplied me over past years has become seriously ill. It meant I had to fall back on recycling. What may seem to be a cheap solution, in my case it was the only one and it intro-duced me to the value of creative recycling. Christmas in Uganda is not a big celebration. The Church is little over one hundred years old and the poverty of the people does not give way to gift-giving on a one to one level. Snow and Santa Claus are only to be found on Christmas cards from abroad. But one thing we do have in Uganda is a super liturgical celebrations in church with the Christmas morning Mass lasting up to five hours. All the Christmas hymns are rolled out and engage the congregation to the last man, woman and child. The celebrant can take up to an hour for his homily while the offertory procession, organised beforehand and put together outside the church, dances its way to the altar bringing gifts of all kinds: live hens, sacks of rice and potatoes, a fully grown live goat or two, assorted vegetables, baskets of the finest fresh fruits and a hotchpotch or symbols: bows and arrows, children’s school books and pencils, plastic buckets contain-ing bars of soap, washing powder and anything else decided by the people of the congregation according to their life circumstances. The procession can last a full half hour and is extremely colourful, accompany-ed by singing, clapping, ululating while children run in and out of the procession at will. One would not be blamed for thinking the emphasis belongs more to a concert than to a church liturgy. At the end of such a protracted liturgy one would expect the people to be in a rush to go home. Not so in Uganda. After Mass the impromptu get-together can go on indefinitely as extended family members meet and greet each other, many coming back home to be with parents and grandparents for Christmas. 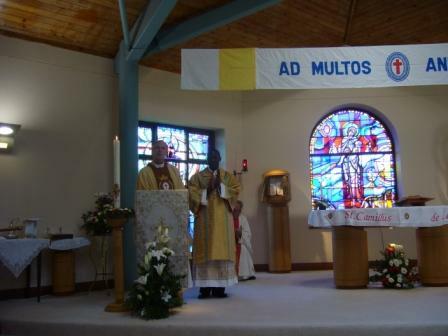 Leading such a liturgy places the priest at centre stage and it is simply not possible not to get caught up in the overall jollification even without speaking the local language. As well as that the celebrant priest receives a goodly supply of the edibles brought to the altar at the offertory procession. It is taken for granted that I would decline the live hens and one of the male goats! 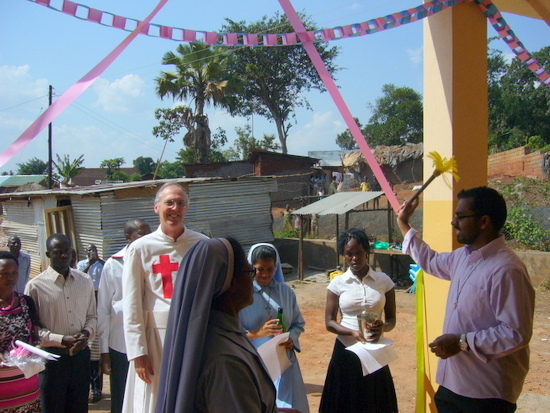 What the parish house does not need is distributed among the poor. I’ve never been to a Christmas dinner but I know it can match the liturgy in church for its duration and celebration. The meal is an evening celebration beginning around 6.00 pm. Food is cooked the day before and reheated before serving even though food that is cold poses no problem. The meal is very as much a get-up-and-walk-around as it is a sitting on the ground. It can last all evening and indeed well into the night. Stay the night they will tell you and this does not involve hotel or B&B accommodation. All you need is your straw mat and you find yourself a place and a good night’s sleep on the ground at the back of the house. Everyone knows that the party will continue next day and maybe again into that night. 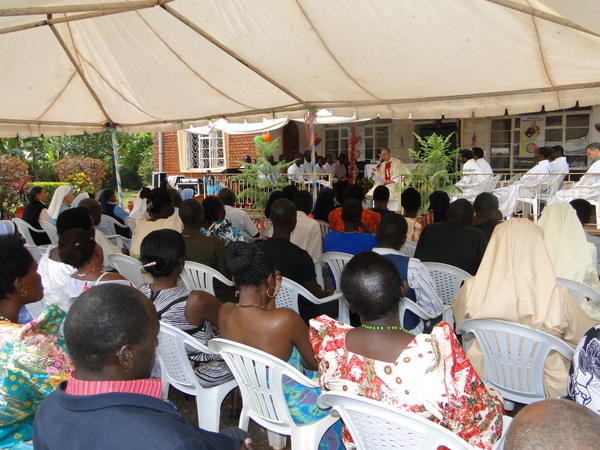 A tradition has grown up whereby Ugandan make serious efforts to put money aside for the Christmas party. Indeed thieves are particularly active during December. What is collected for the Christmas party must be spent to the last penny. Apart from warigge (the local illegal brew), beer and minerals have to be bought. Meat and vegetables are home produced – a goat or two is killed and sometimes also a pig. That is the men’s part while cooking is the exclusive domain of the women and is done outdoors on improvised three-stone fires of charcoal or wood collected by the children the days before. If the local priest takes part he does so with abundant prayers. A speech or two may follow and in Uganda nobody shies away from public speaking. Getting these speakers to wind up can be a problem while nobody seems to mind that the food is getting cold! 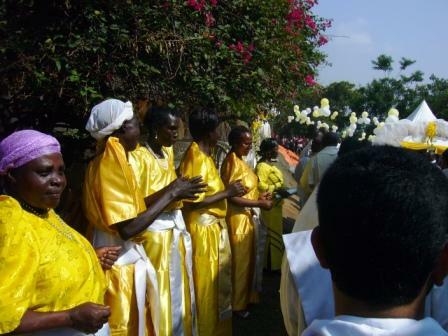 It is thus the Ugandans celebrate Christmas and they would all wish me to greet you for Christmas with implorations to a myriad of pagan gods and goddesses whose blessing are also implored along with that of the Bethlehem Holy Family. Recession!, what recession? The Republic of Uganda, one of the smaller countries in the great continent, lies on the Equator to the east of Africa. It is considered part of East Africa along with neighbouring Kenya and Tanzania. It obtained independence from Britain in 1962 and became a republic in 1967. It has a population of 21 million, mostly christian (50% of these are Catholic, the others are Church of Uganda. Anglican) with 10% muslim. It covers an area of 230,000 sq. klm. Known as “The pearl of Africa” (Sir Winston Churchill) for its favourable climate, it consists mostly of a savanna plateau with part of Lake Victoria in the southeast and mountains in the southwest, reaching 1509 m. in the Ruwenzori Range. English and Luganda are the official languages. Luganda was chosen because it is the language of the Baganda, the largest of the 32 tribes and is centered in the south of the country incorporating the capital, Kampala. The first explorers from Europe, Speke and Grant arrived in February 1862. They were followed by the famous Henry Morton Stanley who arrived in 1874. 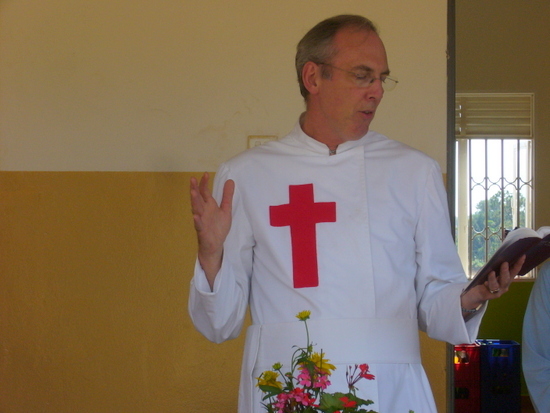 A devout Protestant, he appealed to the Church of England (Anglican) for missionaries to Uganda. Those were the glory years of Queen Victoria and the British Empire epitomized in the saying that the sun never sets on the queen’s Dominions. “Britania rules the waves” with the great three: the Empire, the Monarchy and Church of England. 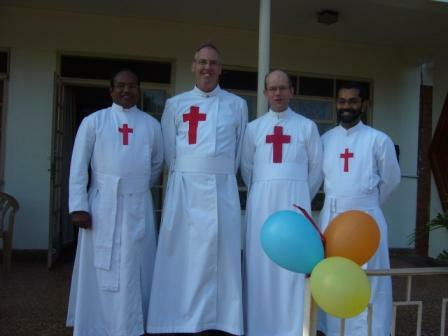 Before too long the Anglican missionaries arrived. The first catholic missionaries followed shortly afterwards. They were the White Fathers led by Fr. Simeon Lourdel in 1879. By the time Fr. Lourdel arrived, the Church of England mission was already established, under the leadership of an engineer Alexander Mackay. He was very much opposed to Catholicism and this was to cause serious problems later on. Meanwhile, christianity, both Anglican and Catholic, took hold quickly and even produced the Ugandan martyrs, 23 protestants and 22 catholics. Pope Paul VI canonized the catholic martyrs in 1964. The lines were quickly drawn: the Catholic missionaries were French and the Anglican missionaries were British. The long-standing enmity between France and England as well as the religious antagonism between catholics and protestants had come quickly to the surface. To counteract this and to prove that the catholic church was also British, the Mill Hill Missionaries arrived from London in 1895 thus forming the second wave (the French White Fathers formed the first) of catholic missionaries. By then the British colonial power had more or less taken over and the territory of Buganda, the largest nation within modern Uganda, became a British Protectorate (1895) with the local King being retained as political head. 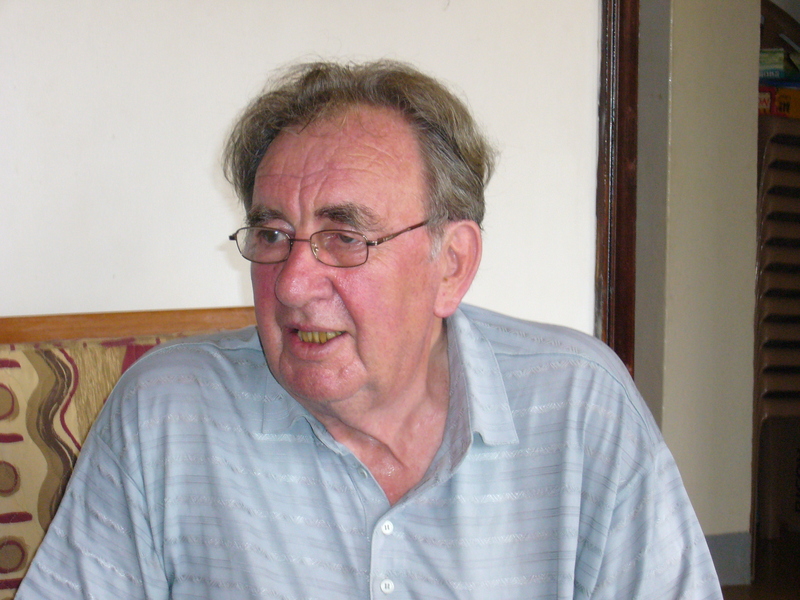 The British remained in control until the spirit of independence took root in Uganda as it did in the whole of Africa following the second World War. This led to independence in 1962 and finally the country became a republic in 1967. 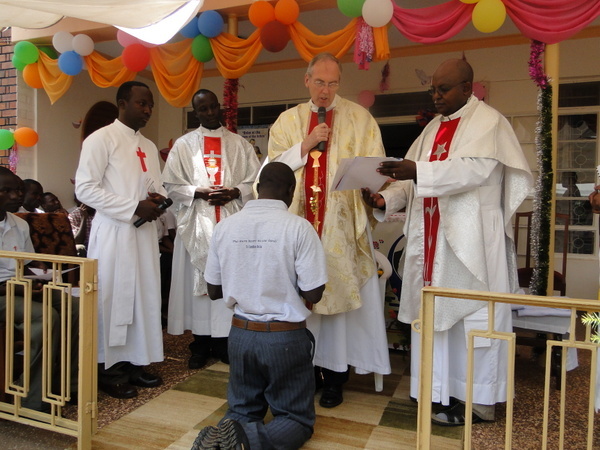 The catholic church made great strides with the White Fathers and the Mill Hill Missionaries being joined by the Comboni missionaries (Verona Fathers) coming south from the Sudan. It is well known that in Africa poverty and the lack of education interact to impede progress in development. Along with that there is the debt burden and not a little corruption. Uganda is no exception. The effort to establish a multi-party democracy on gaining independence from Britain in 1962 led only to greater division along tribal and religious lines. There was a catholic political party as well as a Protestant political party! A period of three military dictatorships followed until the present president brought about peace and a one party government. Over the past twenty years this had brought a certain stability and considerable economic progress. Officially, primary education is “free for all” but there are many factors, school uniforms, books, etc., that make it very difficult for a large percentage of the poor to attend school.. Nature has blessed Uganda with one of the most favourable climates in the world. Though situated on the Equator, the central plateau reaches a thousand meters above sea level leaving the whole country with two springs and two autumns, thus providing the blessings of a second harvest every year. Therefore, unless the country is hit by natural disasters such as famine or drought, the people, with relatively little effort (in planting, harvesting and planting again), are always sure of basic food as a gift from nature. As we shall see later, poverty, grinding poverty, is had when sickness strikes even in the simplest forms like snake bites and minor infections due to the absence of basic counter-treatments. In that situation, it is easy to imagine the horror wreaked by the HIV/AID virus over the recent past. It can be said that the only poor, those who are truly destitute are the sick, whatever be the cause of the sickness. 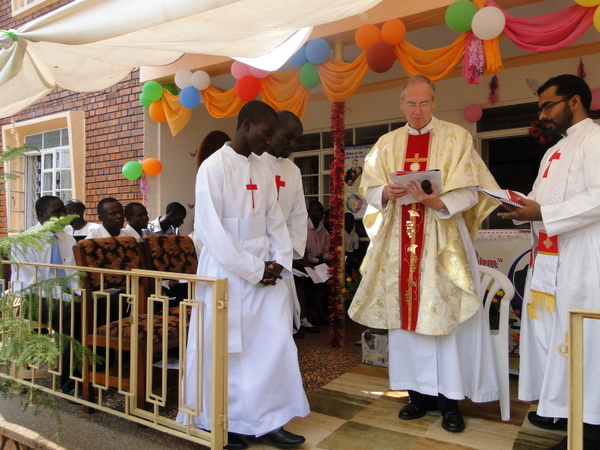 We must remember that the church in Uganda, like so many other countries in Africa, is only a little over a hundred years old. This means that the influence of paganism is still very much present in the minds and religious practice of the people. Furthermore we must remember that Islaam had already established itself before the arrival of the first christian missionaries. Travellers from Zanzibar in modern Tanzania had already been trading with the kings of the Baganda tribe bringing cotton, guns and gunpowder in exchange for ivory. These travellers brought Islaam to the country along with them. Among the many pagan customs that prevailed, and continue to prevail, were polygamy and witchcraft. Conversion did take place and many were baptized but the church readily admits that evangelization is anything but complete. 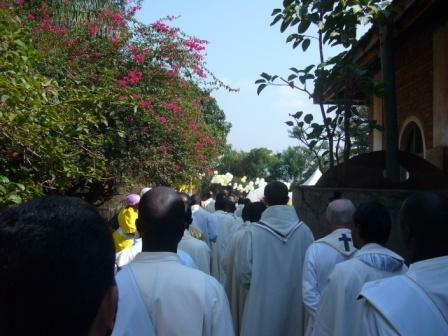 The conflict between the Catholics and Protestants, which ended in the battle of Mengo in 1892 and a crushing defeat of the Catholics, inflicted lasting wounds that only since Vatican II have begun slowly by slowly to heal. 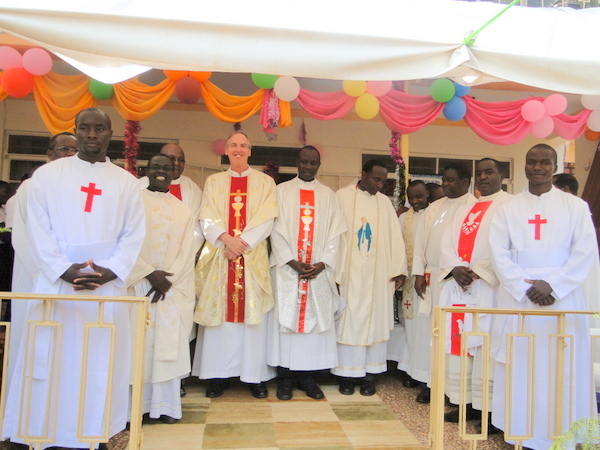 All but one of the church leaders now are Ugandan and the diocesan structures are in place. Ecumenical relationships too have greatly improved. But poverty, lack of basic infrastructure (roads, public transport, communications media) limit the church’s ability in reaching the people in their villages and in the far flung countryside. The vast majority of the people still depend on the catechists to maintain, and hopefully develop the religious sense and practice. 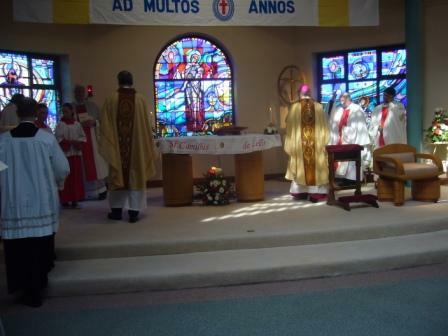 An average parish can have as many as twentyfive sub-parishes to manage. 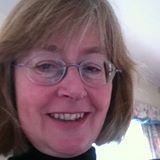 This wonderful work done by catechists more often than not is lacking because of poor selection of catechists (they are poorly paid and their on-going training is non-existent) and the inadequate training they receive before setting out on a ministry that is crucially important to the life of the church. 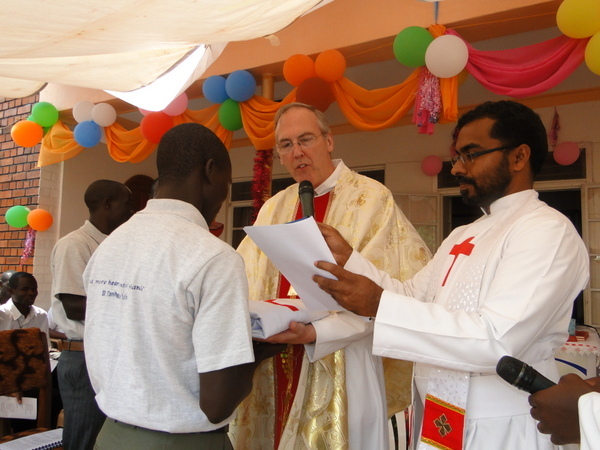 The serious reduction in the number of catholic foreign missionaries coming Europe and N. America has dealt a certain body blow the church services like schools, hospitals, healthcare centres. In a word, manpower and money dried up as one institution after another was handed over by missionary congregations to indigenous Religious. The effect is very noticeable and is a cause of major concern for the church authorities. On the other hand, one can ask: is local and less not better than foreign and more? But the poor feel the difference, the sick feel the difference as they had all got accustomed to hand-outs without giving a thought to the need for some form of self-sufficiency. The begging-bowl mentality had well and truly established itself in the minds of the people. One thing is certain, this widespread and rather dramatic hand-over took place without an adequate preparation and actual recognition by all concerned of what was in fact taking place and what was involved. Fr. 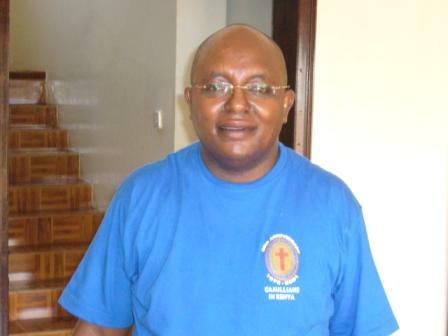 John Mary Walligo is professor of history at the Catholic Uganda Martyrs University. He has written extensively on social and pastoral issues. The following are some of the points he has made regarding the African worldview in relation to health, sickness, death and dying and the treatment of the sick. “There are four main categories of diseases in the African concept: a) the African indigenous diseases; b) the western foreign diseases; c) the chronic diseases; d) the plague or epidemic. The cultural belief that every disease has a cause from outside; thus the ardent search for the cause of the disease before the search for the cure. The cultural belief that there is a cure for cancer, HIV/AIDS and for any other disease if only more search is made in the right direction. In the African traditional religion, the Creator-God is the primary source of all healing and cure. All others receive their healing power and curing power from God. For any cure, thanks must first be given to God and much later to the medical personnel. When you are treated for a disease in a religious atmosphere, you have more hope and confidence to get cured because there the medical staff use both God and scientific medicine. At no time during sickness, even when all signs show that one is about to die, should anyone give up on the possibility of a “miraculous recovery of the sick person”. Anyone who dares to give an open prediction that one is not going to survive the night or the week may be considered a “witch”. Anyone who begins any sort of preparation for the removal of the dead body or makes any arrangement to that effect is also considered a “witch”. In sickness, one’s ancestors, the living-dead, are invoked and the ancestral ‘deities’ are also invoked to provide a much needed intervention for a cure or for healing. Medicine and religion in Africa are inseparable. Before taking medicine most African sick people will utter a prayer to God or bless themselves so as to make the medicine truly work. Any medical “atheist” who does not give medicine in the name of God is ignored. It is easy to see not only the difference but also the clash of cultures inevitably encountered by the foreign missionary and every NGO member for that matter. Blessed are those who recognise these differences and place themselves in a humble, learning frame of mind. Apart from the extreme poverty and absence of the essentials – medication, drugs, diagnostic equipment - the professional standards can be maintained even with difficulty because of lack of funds to encourage the better qualified to remain in their own country. Uganda experiences the brain-drain as much as and perhaps more than most countries in the developing world. The lure of better wages and conditions as well as the opportunity for professional self-advancement succeed all too often and we lose our best university graduates. The conditions facing the sick are therefore affected. Over the past ten to fifteen years, Uganda has experienced considerable progress. However, because much of the financing of projects in the fields of research and development, political unrest and upheaval could very easily turn that progress around to the immediate detriment of the poorest in our society. As in the case of so many countries in the African continent, our future is not guaranteed. 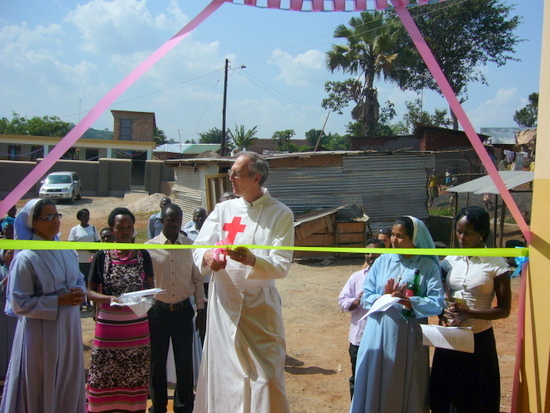 The first Camillian foundation – why Uganda? 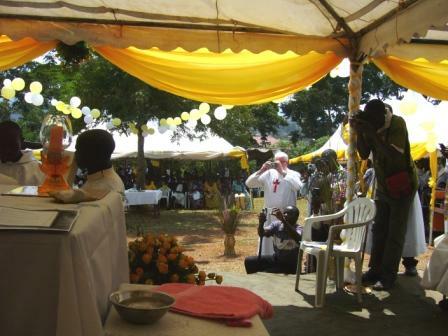 With the development of the Camillian Lay Family, the Anglo Irish Province had been studying the possibility of a mission foundation and decided on Uganda as a millennium project. Uganda was chosen because of its closeness to Kenya and Tanzania and also because the official language is English. Two exploratory visits (1998 and 1999) served to identify the needs of the sick in six different dioceses and meet the respective bishops. Subsequent invitations came from five of those bishops. 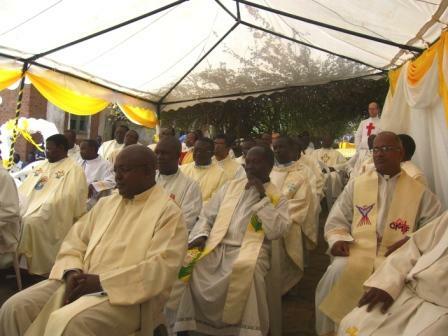 The invitation from Bishop Ssekamanya of the Lugazi diocese was chosen and the first two Camillian confreres arrived on October 24th 2000. 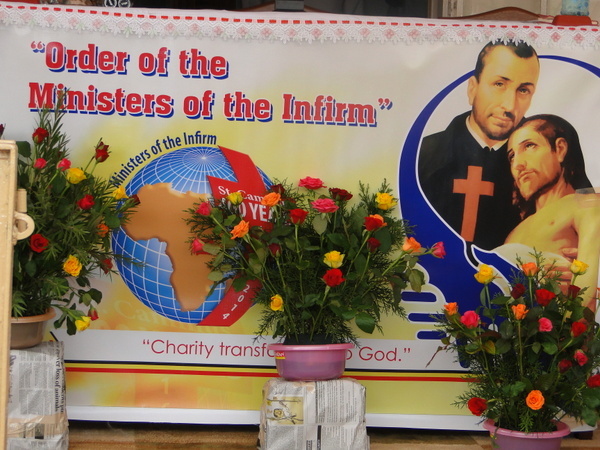 The hopes of the Province for a camillian missionary foundation as a Millennium project was achieved. 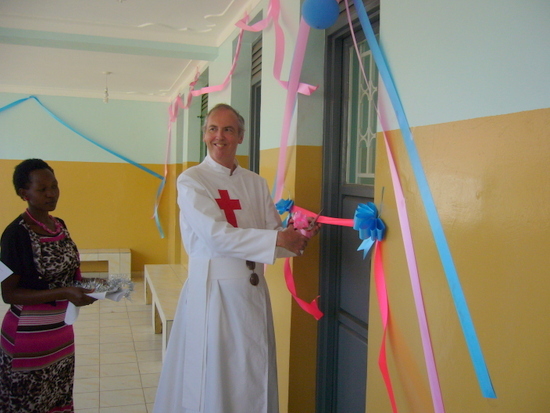 The first challenge was the complete restoration, by the Province, of a house given on loan by the bishop in the compound of St. Francis hospital, Nyenga, ten miles from the town of Jinja. The camillian ministry has a twofold dimension: 1) setting up a mobile clinic for the care of HIV/AIDS sick and dying in the bush and 2) pastoral healthcare animation and vocation promotion. The mobile clinic is already up and running thanks also to Fr. Gregotch (Austrian provincial) whose help provided a new MIVA ambulance to overcome the major problems of driving over dirt roads to reach the sick in the bush. With the help of local doctors and nurses, drugs and essential medication and counselling are provided for the sick and dying as well as food for orphans whose parents have died of AIDS. Pastoral healthcare animation has the other confrere as member of the Bishops’ taskforce for the development of the pastoral care of the sick at national level as well as being involved in retreat work and days of prayer for healthcare personnel. 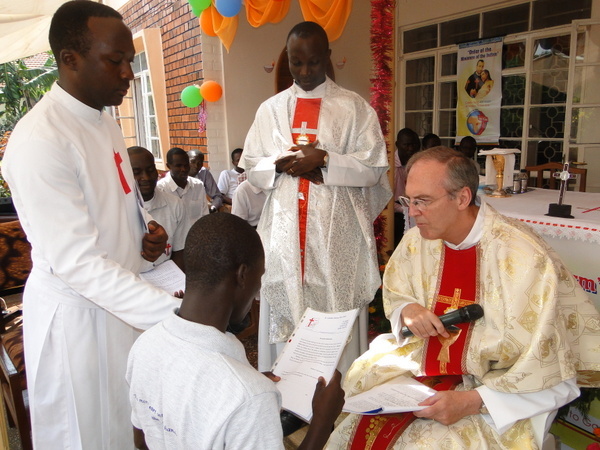 Under the direction of a confrere, the vocation promotion is in the hands of a newly formed vocation promotion team made up of three lay people involved in healthcare and the vice-rector of the local minor seminary. 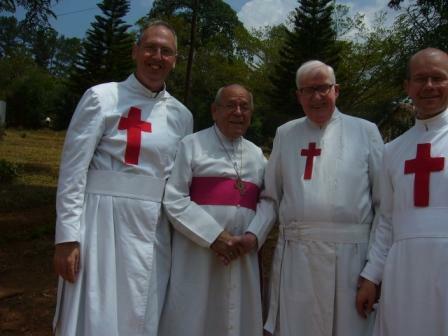 Their role is to assist in the promotion of vocations and also in the assessment of those who present themselves. The team meets once a month. There are already seven potential candidates at the early stages of enquiry who are being considered by the Team. Our hope is that out of this Team we will be able to form the nucleus of the first branch of the Camillian Lay Family. 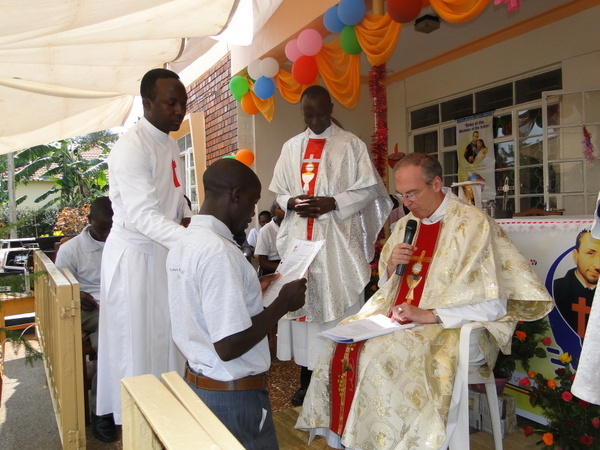 On the Feast of St. Camillus 2003 we received an invitation from the neighbouring bishop Joseph Willigers, MHM, of Jinja to open a house in his diocese. 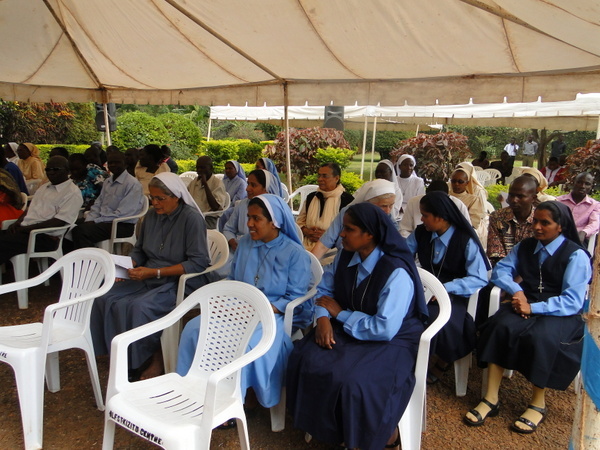 Our aim is to develop a centre that will serve as a conference/retreat centre for the promotion of pastoral healthcare. That will include training courses for all categories of healthcare workers, for chaplains, clerical and lay, for parish priests and catechists and for major seminarians. The centre will also serve as a come-and-see location for prospective candidates, for lay collaborators in our project (Camillian Lay Family), for visiting confreres and visitors in general. Even though we have “just arrived in Uganda”, we have every reason to be men of hope. Looking to the future, we are conscious of the need for more manpower until, in God’s own time, enough Camillians will consolidate and extend this mission. 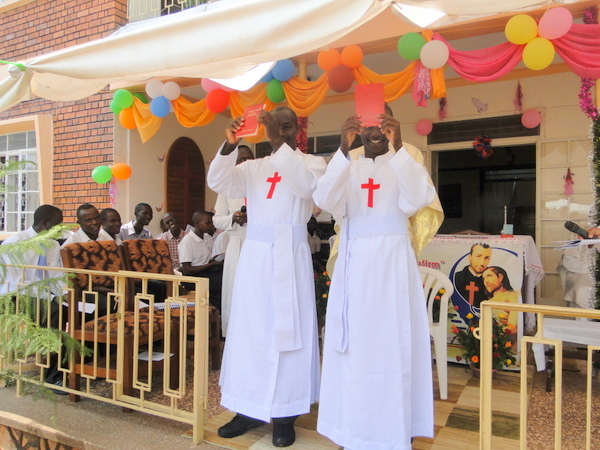 As in the case of other Camillian missionary foundations, we too we look forward to development into a self-sustaining Mission in Uganda by Ugandans. In the meantime we extend our gratitude to God for all his blessings and to our Province and the Order for the wonderful support and encouragement given to us in this newest of “little plants”.